Chiran castle (知覧城) is built at the edge of Shirasu plateau deeply hollowed by the tributaries of Fumoto-gawa river, the one which is also a tributary of Mamose-gawa river which flows the south part of Satsuma peninsula toward northwest. 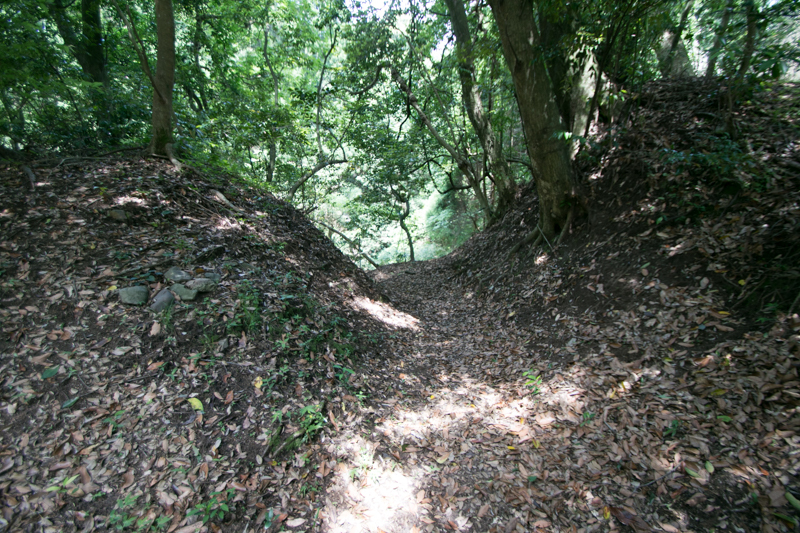 Chiran area is a small valley of 2 kilometer long and 500 meter wide formed as the river terrace of Fumotogawa-river, and Chiran castle exists just at the south of this valley. 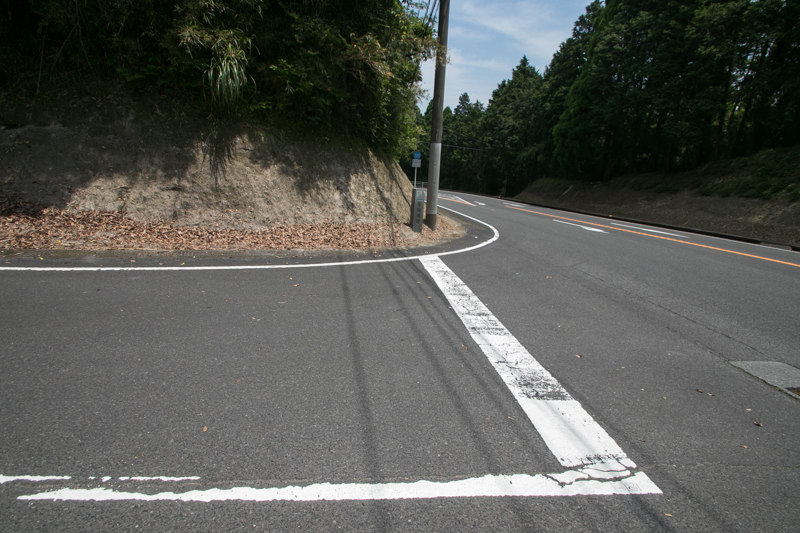 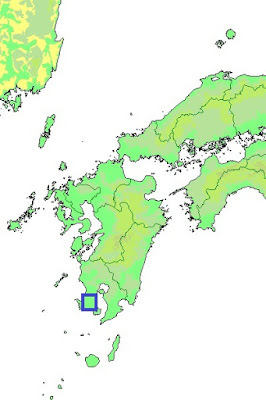 Chiran area is at the point of ankle in the south part of Satsuma peninsula which has the shape of the boots. 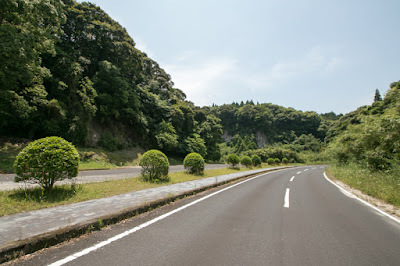 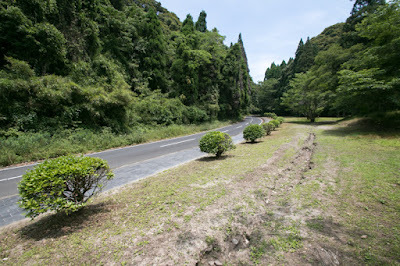 The road from western coast of the peninsula from Izumi area of Hioki area and from eastern coast from Kagoshima city merge at this valley, and spread radially toward southern coast of the peninsula. 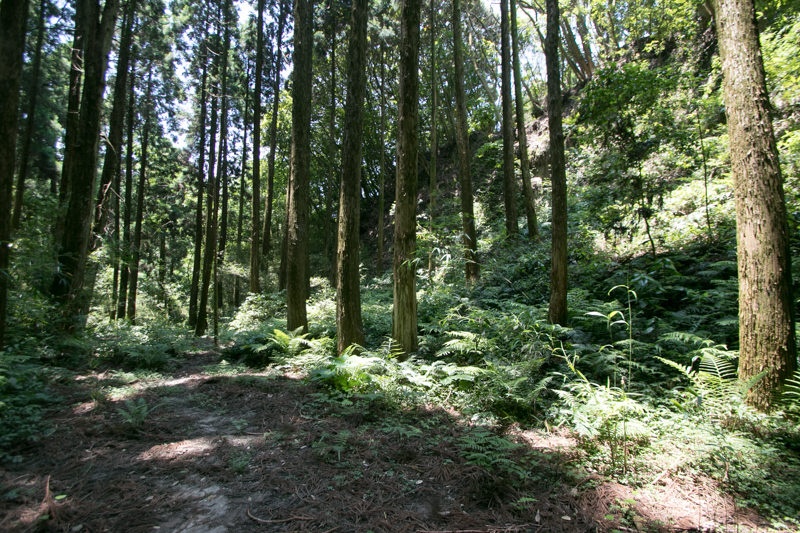 Utilizing well-drained soil and clear stream, currently Chiran area is famous for the production of green tea. 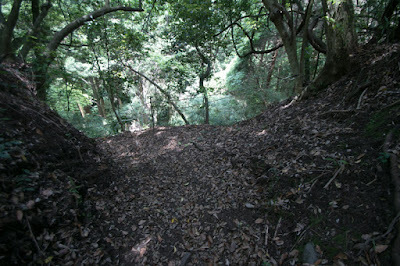 Precise year is unknown but it is said that Chiran castle was at first built at 12th century by local lord Chiran clan. 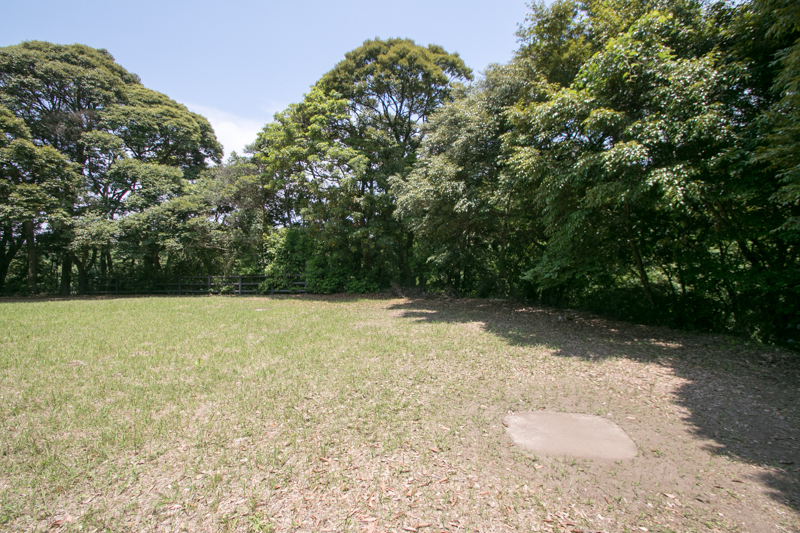 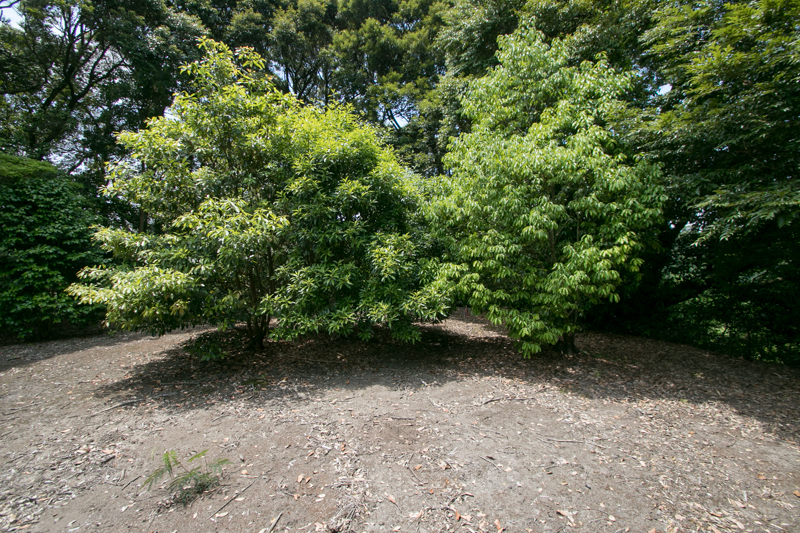 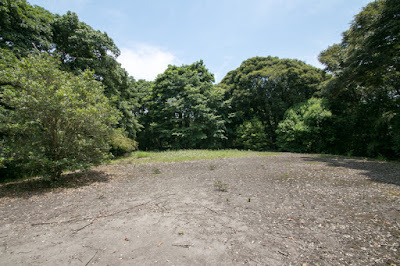 As the ground of current Kagoshima prefecture is covered by volcanic soil not suitable for rice cultivation, the development of this area started later than other area and mainly performed by wealthy central nobles. In 11th century, about half of the land became the manor of Fujiwara clan, the highest class noble and relative of the Imperial household, and was called as Shimazu-no-sho. 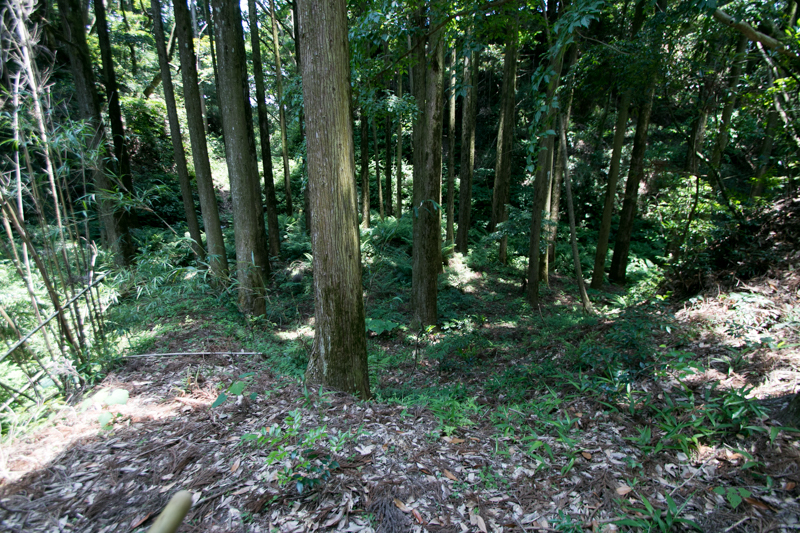 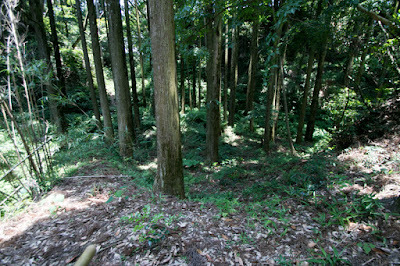 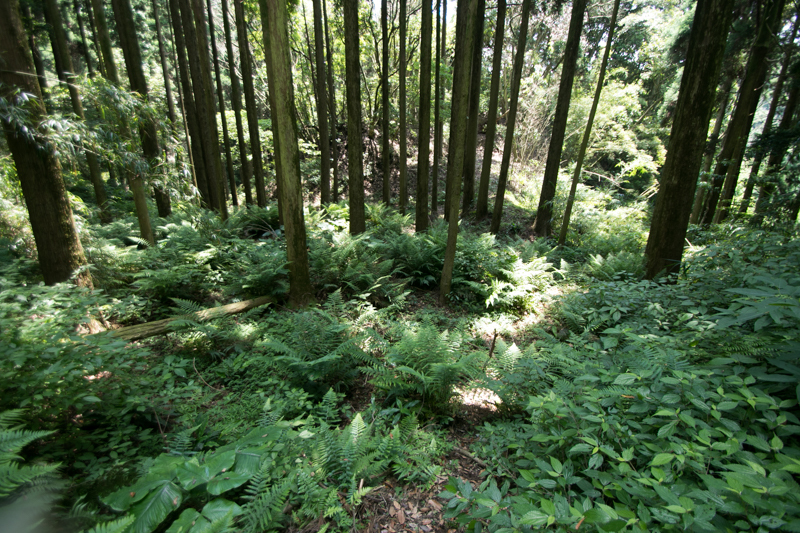 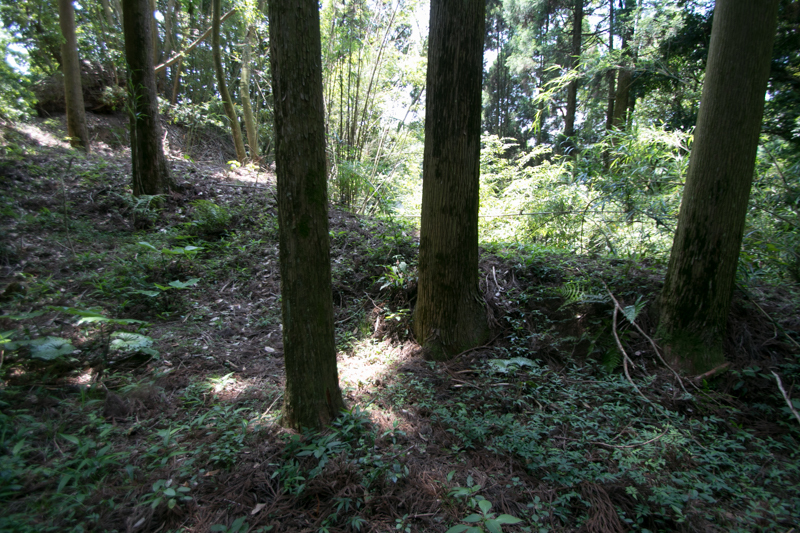 Around the territory of Fujiwara clan there were many small manors, and Chiran area was one of such small manors. Chiran castle was built at the starting point of small river, which might be intended to control the water for cultivation. In 1185, Tadahisa Shimazu (?-1227), the close retainer of Yoritomo Minamoto (1147-1199), the first Shogun of Kamakura Shogunate, was appointed as the governor of Satsuma province, Osumi province (Kagoshima prefecture) and Hyuga province (Miyazaki prefecture). 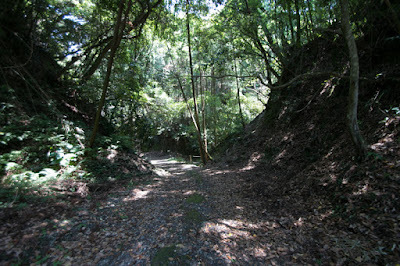 Later Shimazu clan moved to Satsuma province and placed their relatives all over the province. After the fall of Kamakura Shogunate in 1333, at the conflict between Muromachi Shogunate and Emperor Godaigo (1288-1339), Shimazu clan belonged to Muromachi Shogunate and fought against Emperor Godaigo army which once kept major part of Kyushu island. 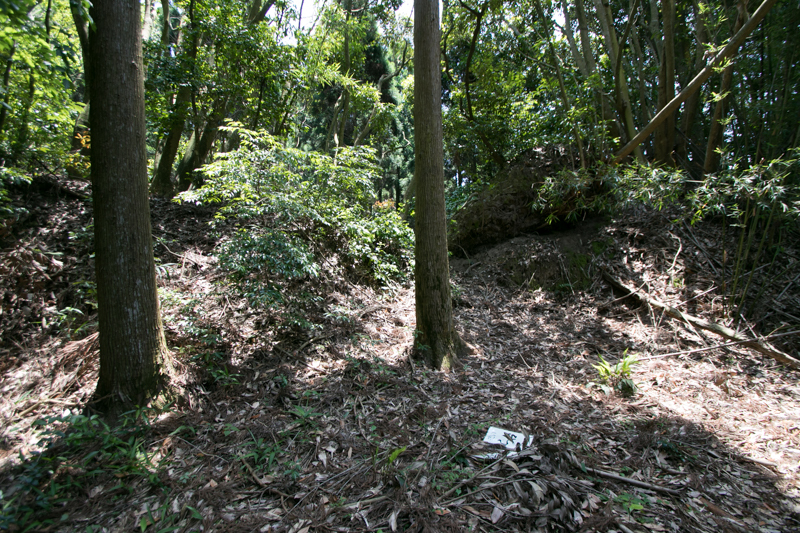 Shimazu clan sometimes conflicted with Muromachi Shogunate army or Emperor Godaigo army, but utilizing its geographical condition at the edge of the Kyushu island, they kept their territory. 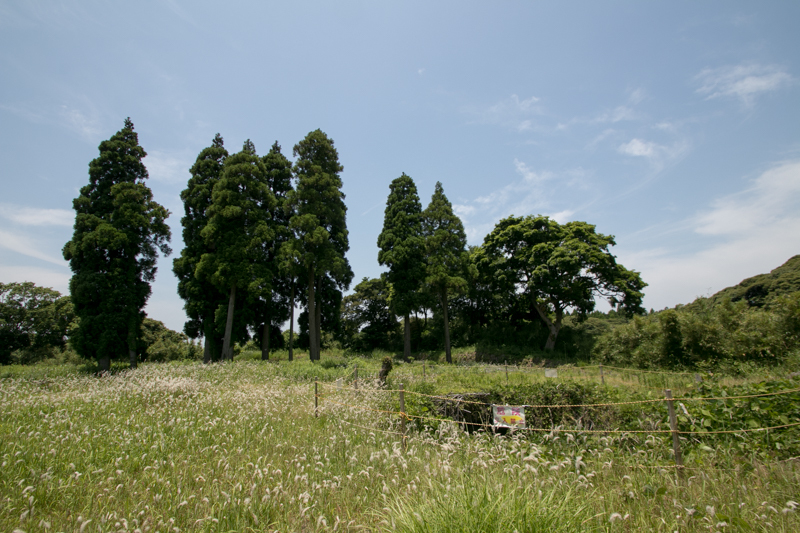 During this battle Chiran clan fell and lost their territory, then Shimazu clan which seized Chiran area placed their relative named Sata clan. 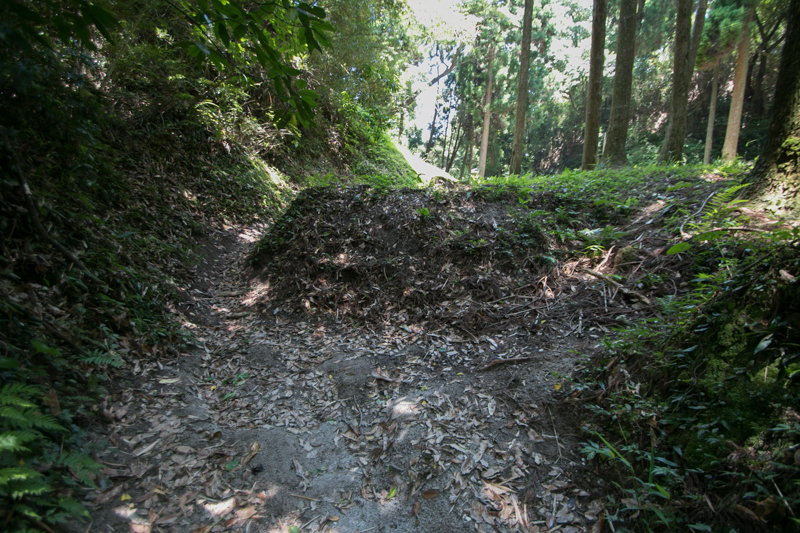 However, once external situation has stabilized around 1400, two main families of Shimazu clan started endless fight for the leader position. 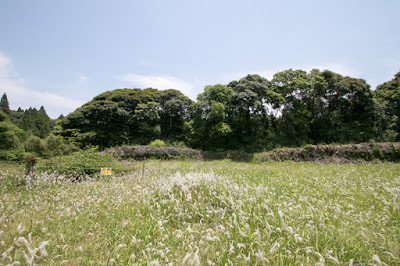 During this battle, Ijuin clan which was a major branch family of Shimazu clan and held west coast area of Satsuma peninsula grew their power and once seized south half of Satsuma peninsula including Chiran area and Kawanabe area. Ijuin clan and Shimazu main family fiercely fought and Ijuin clan once attacked Kagoshima city, the main base of Shimazu main family. But this time Shimazu main family drove back Ijuin clan and reversely broke Ijuin amy. 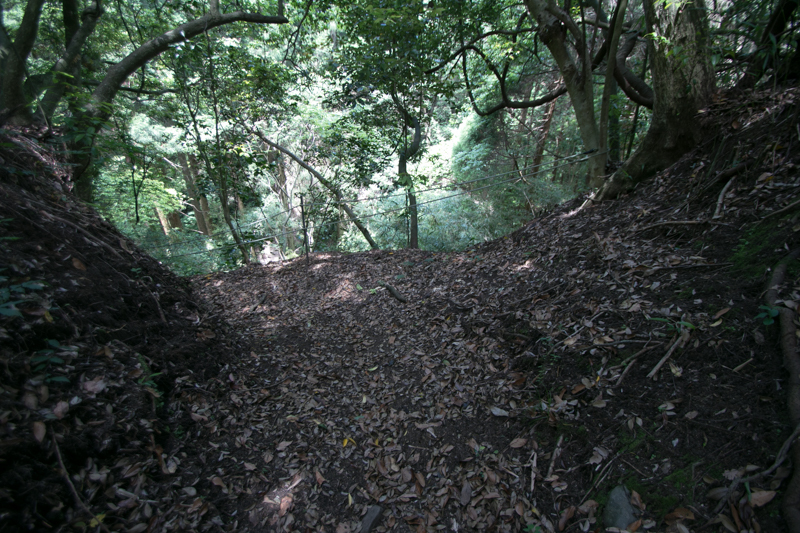 Later Ijuin army lost their territory Ijuin area and was expelled, and Chiran area returned to Sata clan in 1427. 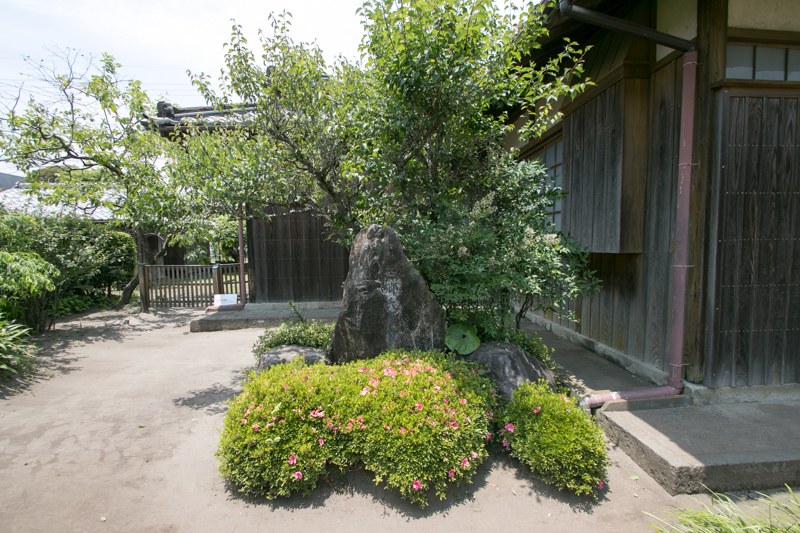 Since then Shimazu main family well grasped the province over 50 years. 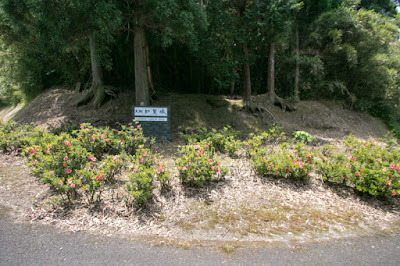 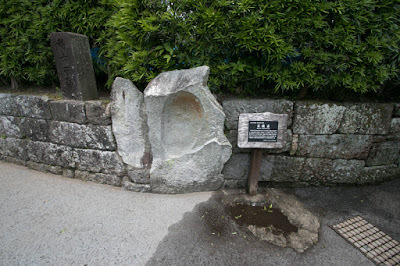 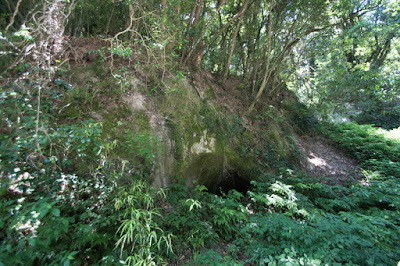 But at the end of 15th century, because of continuous death of leaders in youth, internal conflict with powerful branch families, rise of surrounding warlords such as Kimotsuki clan at Osumi province or Ito clan at Hyuga province, or eruption of Sakurajima volcano, main family of Shimazu clan significantly lost their power. 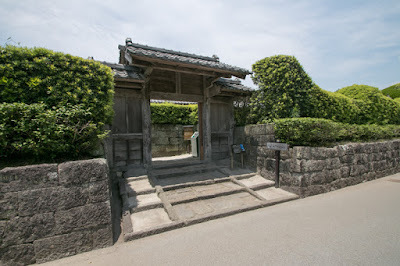 After the long conflict, Sanehisa Shimazu (1512-1553), the leader of Sasshu house lived at Izumi area and Tadayoshi Shimazu (1492-1568), the leader of Izaku house and Soshu house finally struggled for the leader. Tadayoshi placed his son Takahisa Shimazu (1514-1571) as an adopted son of Shimazu main family, and finally rejected Sanehisa Shimazu who opposed to this succession then united Shimazu clan again in 1539. 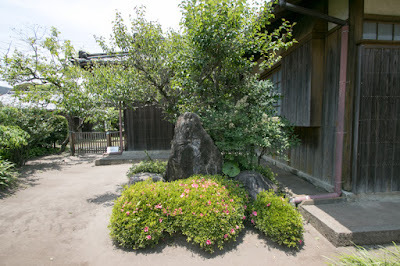 As Sata clan originally had a relationship with Soshu house, during this internal conflict Sata clan supported Takahisa Shimazu and activated at the battles against Sanehisa Shimazu. 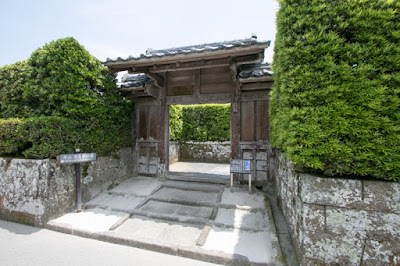 Sata clan became an important retainer of Shimazu main family, and participated in the unification battle of Kyushu island by Shimazu clan, performed by four brilliant sons of Takahisa it mean Yoshihisa Shimazu (1538-1611), Yoshihiro Shimazu (1535-1619), Toshihisa Shimazu (1537-1592) and Iehisa Shimazu (1547-1587). 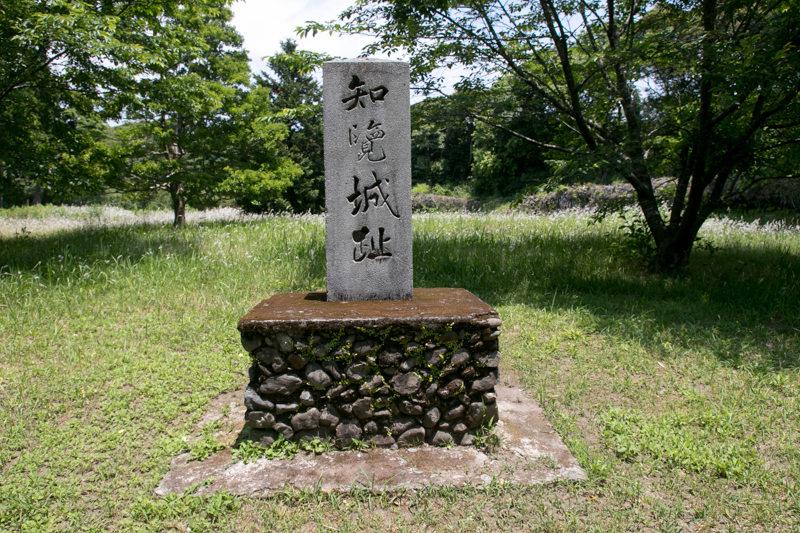 Tadamasu Sata (1562-1641), the relative of Sata clan, became the guard of Yoshihisa Shimazu (1533-1611), the leader of Shimazu clan, and served vanguard at many battles then known as a brave general. 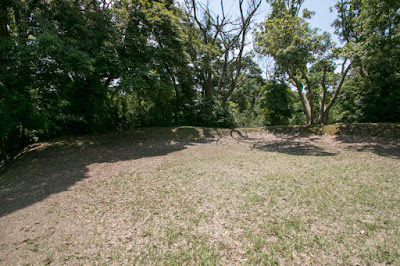 After the surrender of Shimazu clan to central ruler Hideyoshi Toyotomi (1537-1598), Tadamasu participated in the Odawara campaign of Hideyoshi Toyotomi and visited the siege of Oshi castle (Saitama prefecture). 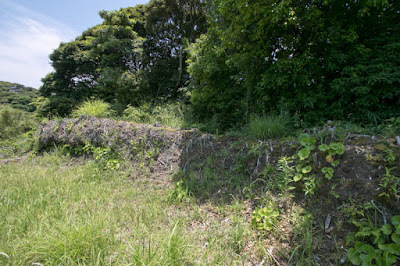 Along with a rise of Sata clan, Chiran castle might be expanded into the main base of major retainer of Shimazu clan. 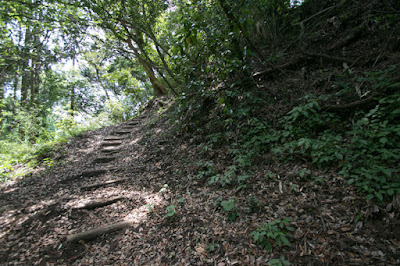 The core part of Chiran castle consists of over 10 terraces of different sized spreads about 250 meter long square, which are surrounded by vertical cliffs. 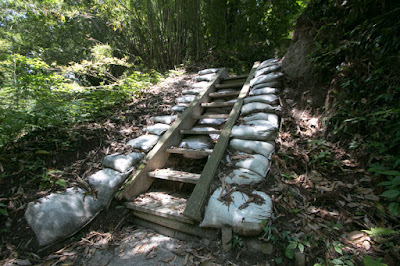 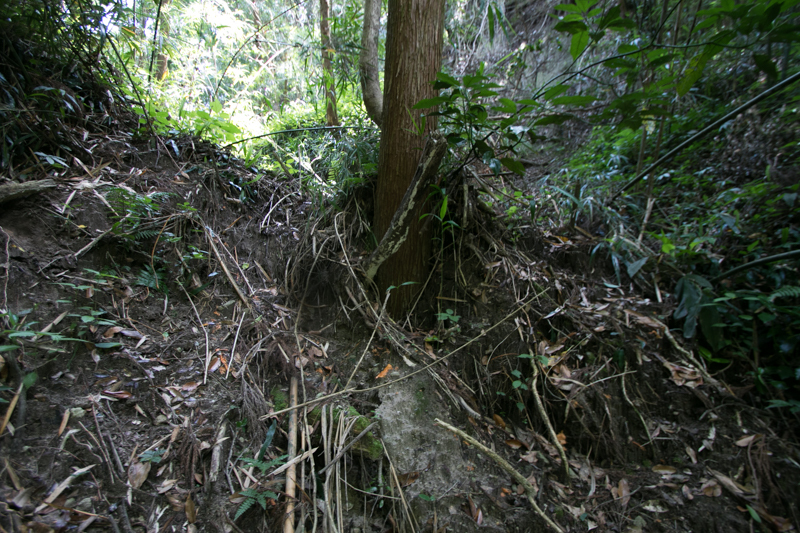 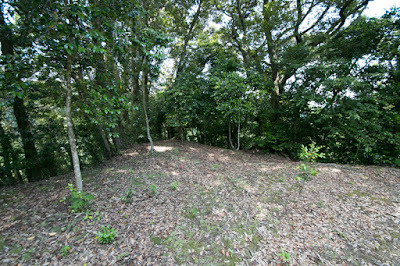 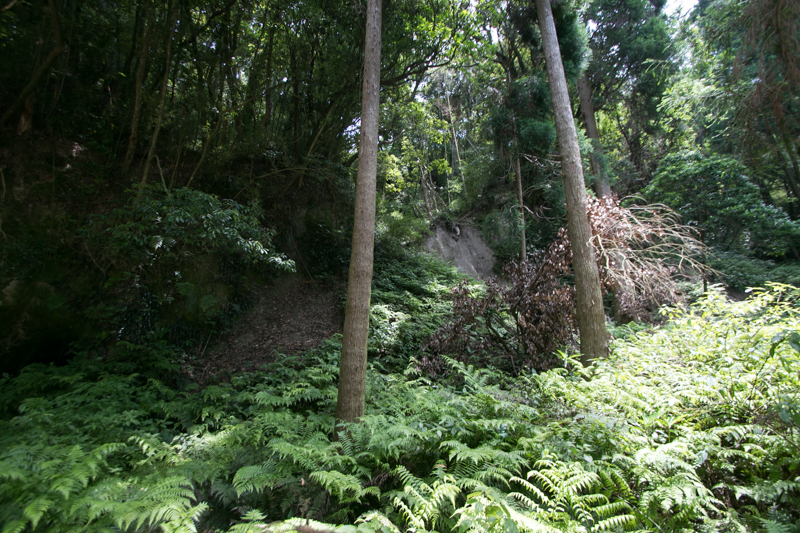 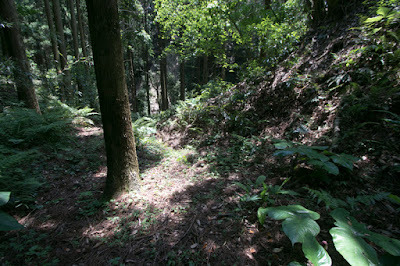 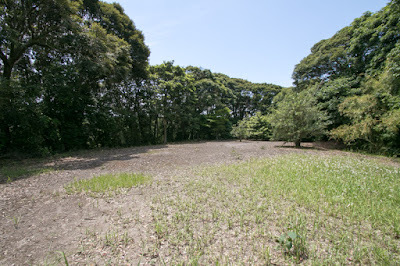 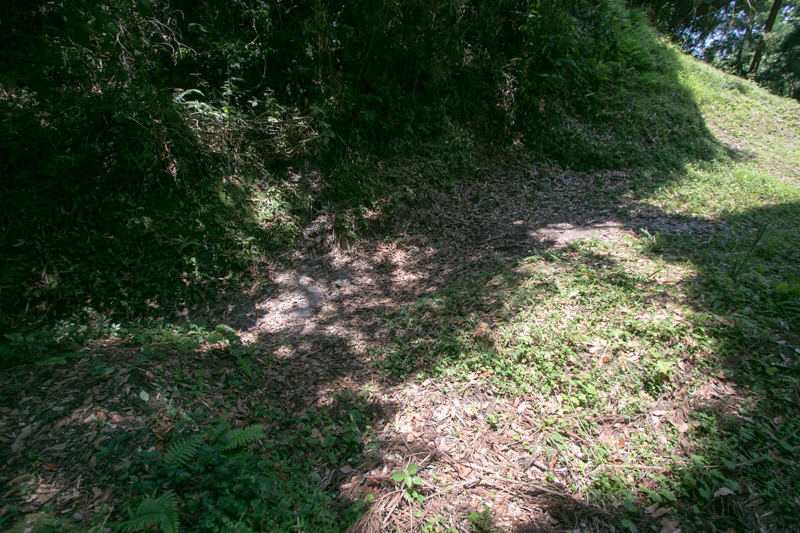 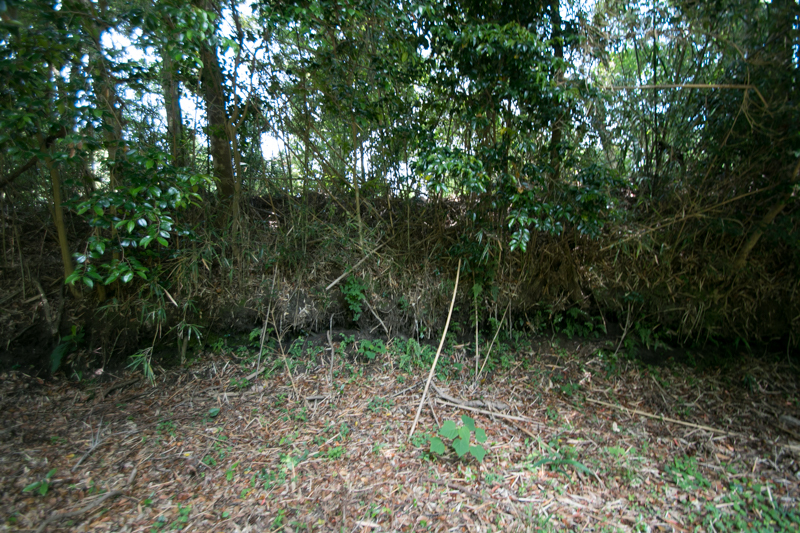 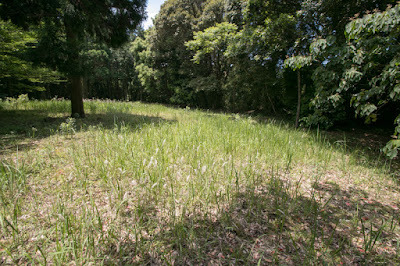 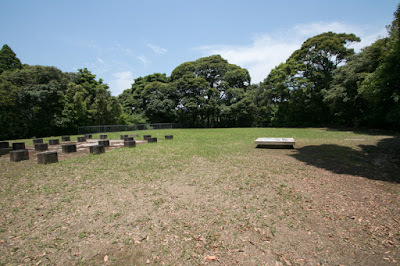 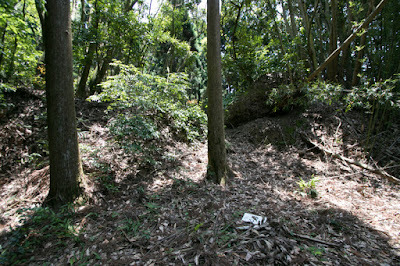 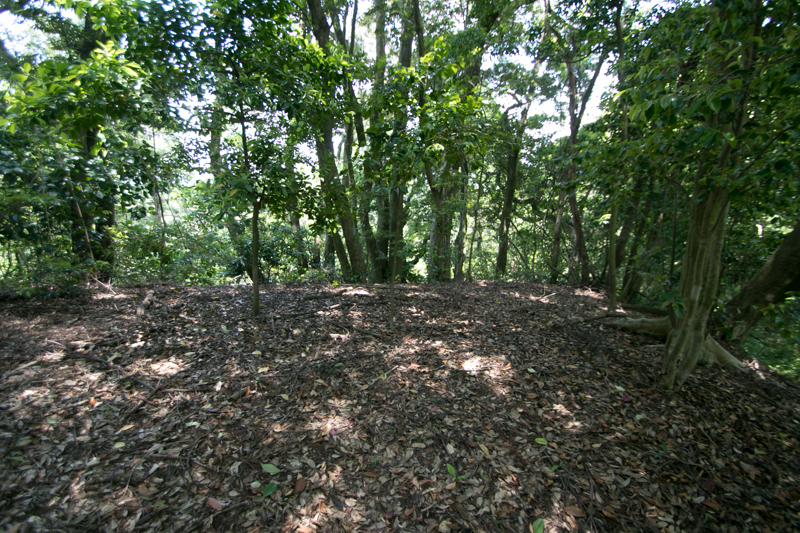 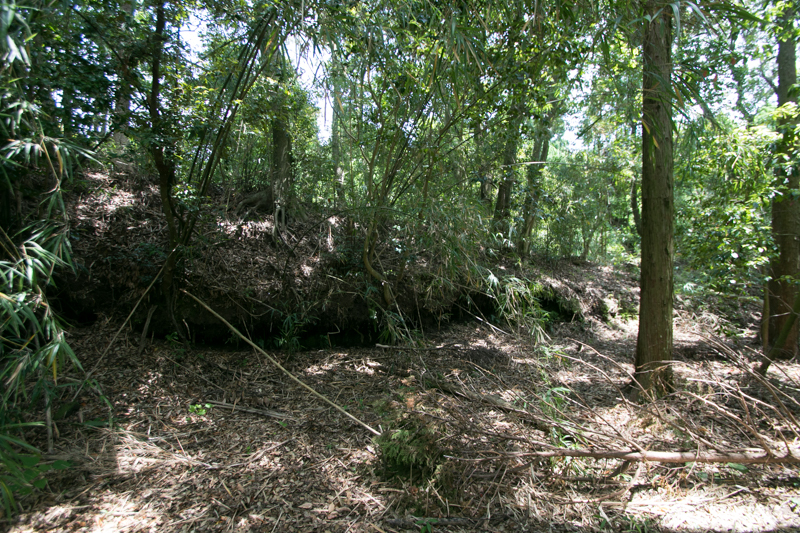 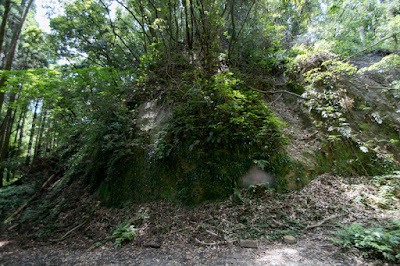 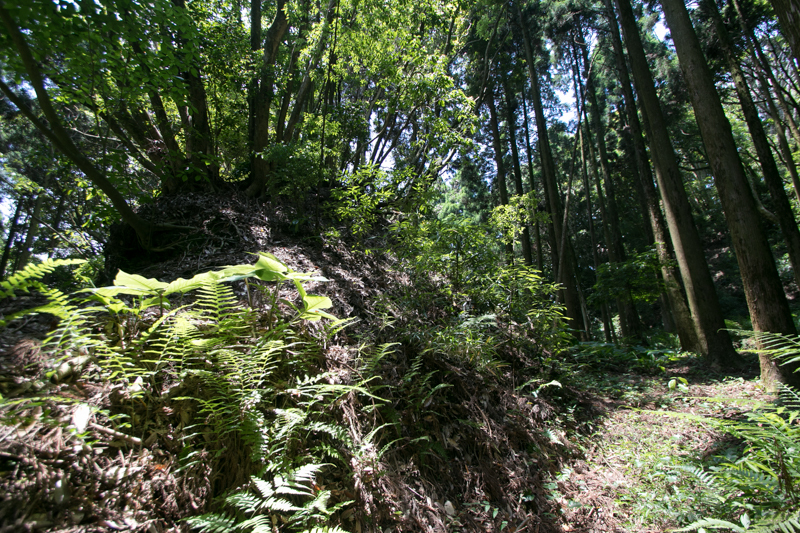 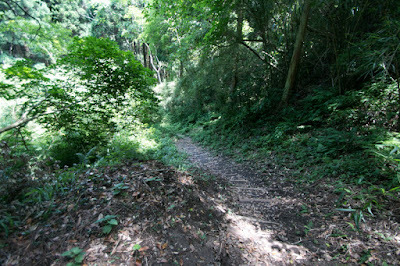 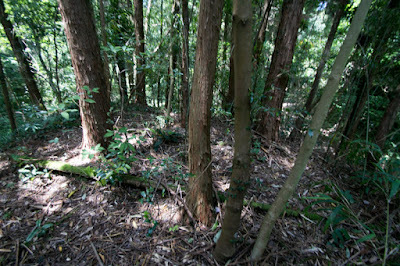 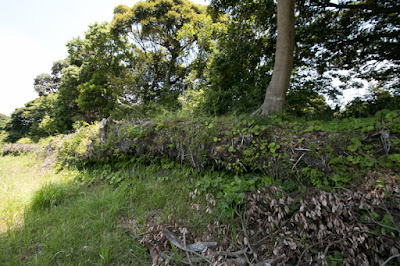 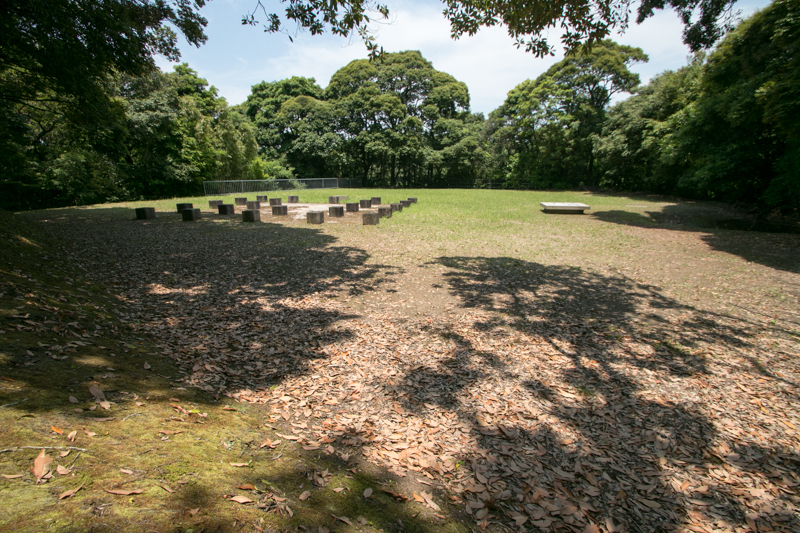 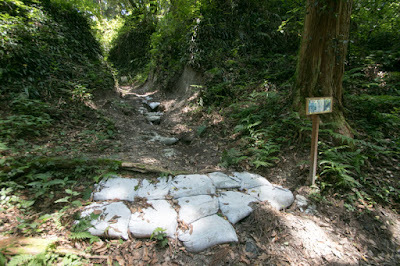 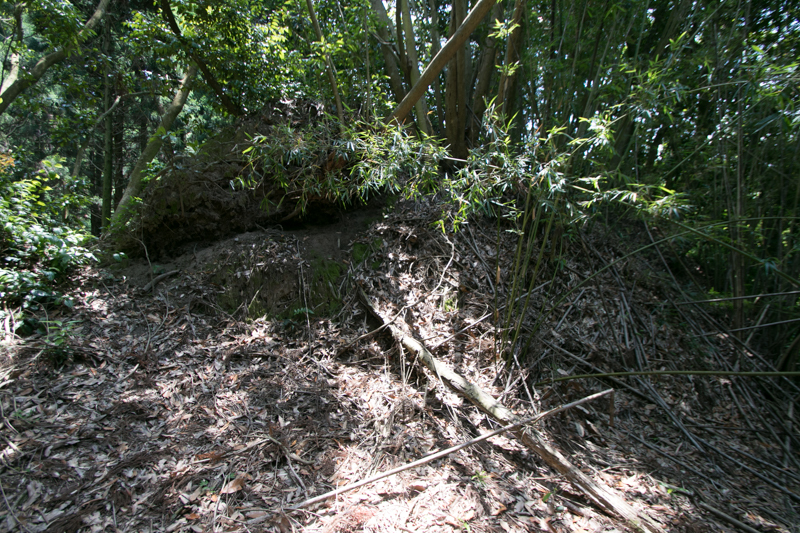 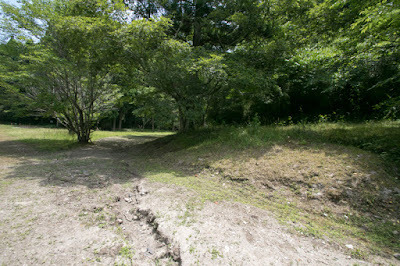 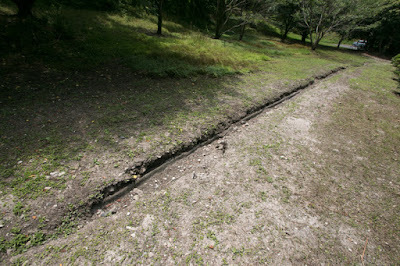 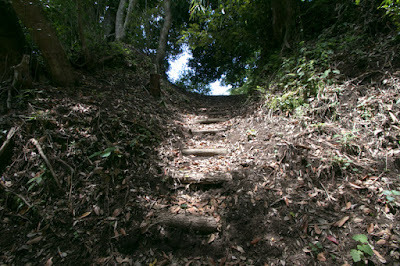 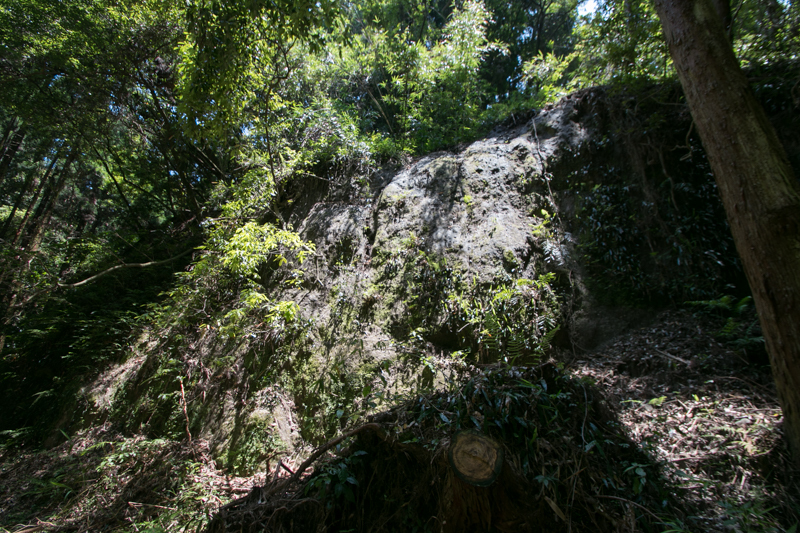 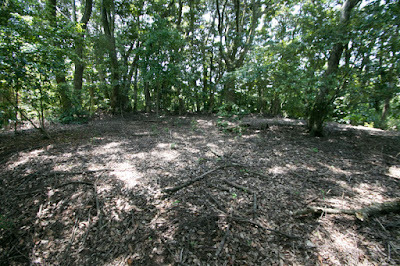 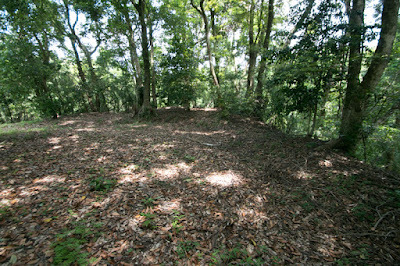 As the ground of castle is covered by Shirasu soil. 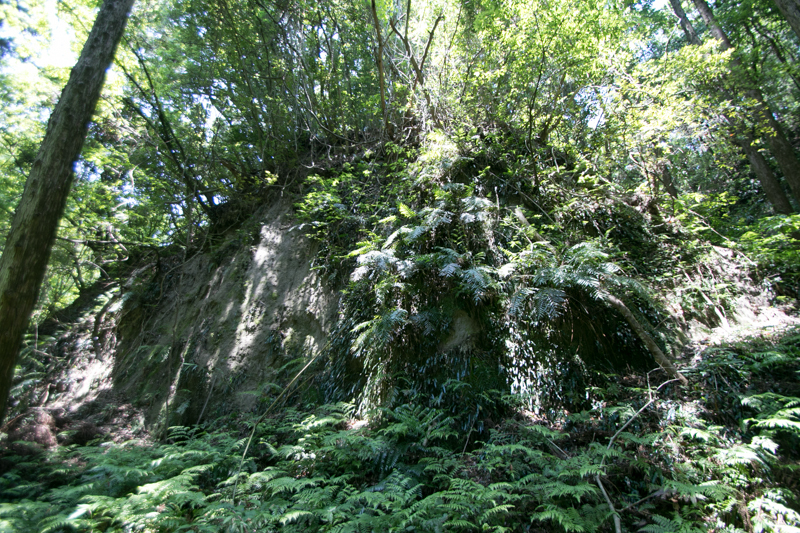 an ancient volcanic soil accumulated over 20 meter height. 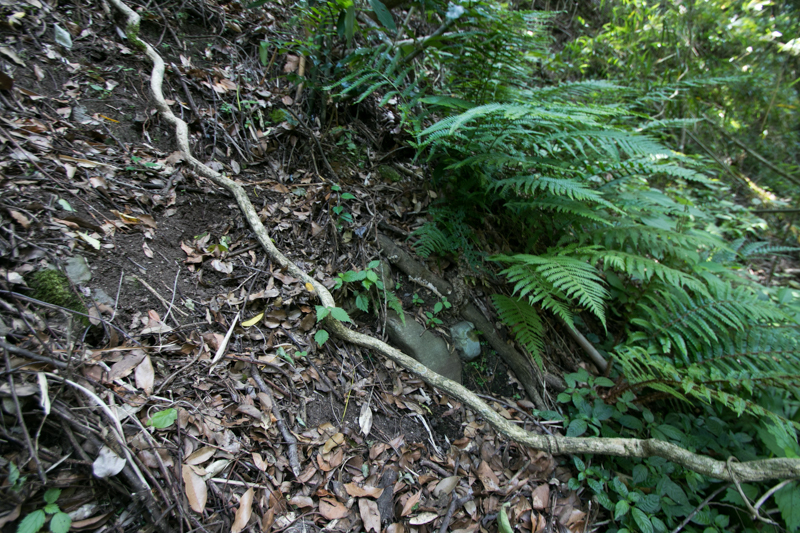 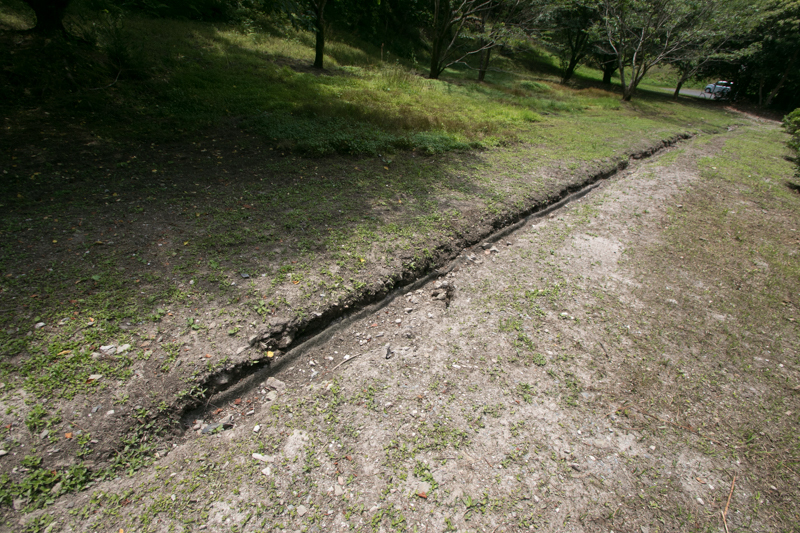 As this soil keep fixed as long as dry condition but easily dug by water flow, if condition applies it becomes a group of terraces separated by deep valleys created by erosion. 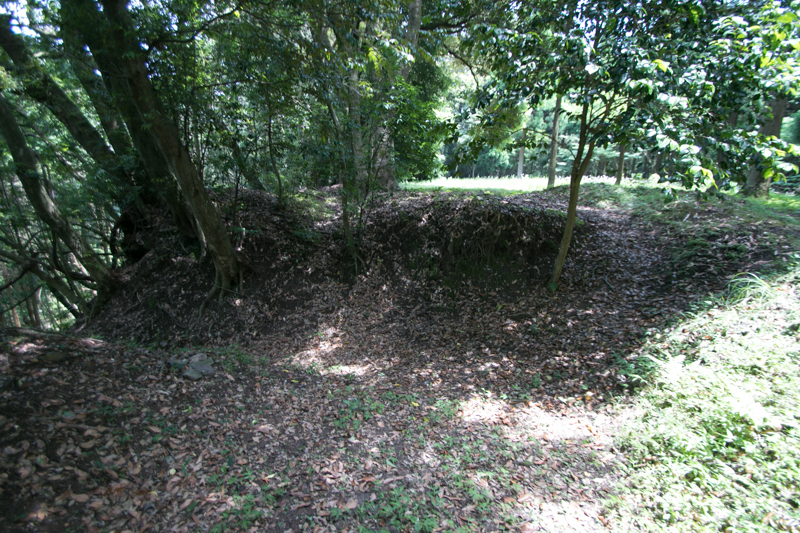 Furthermore, because of soft but stable soil like a clay, it was easy to build clay walls or gates by digging ground surface. 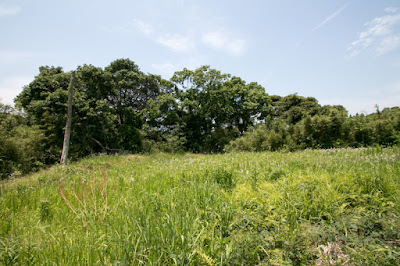 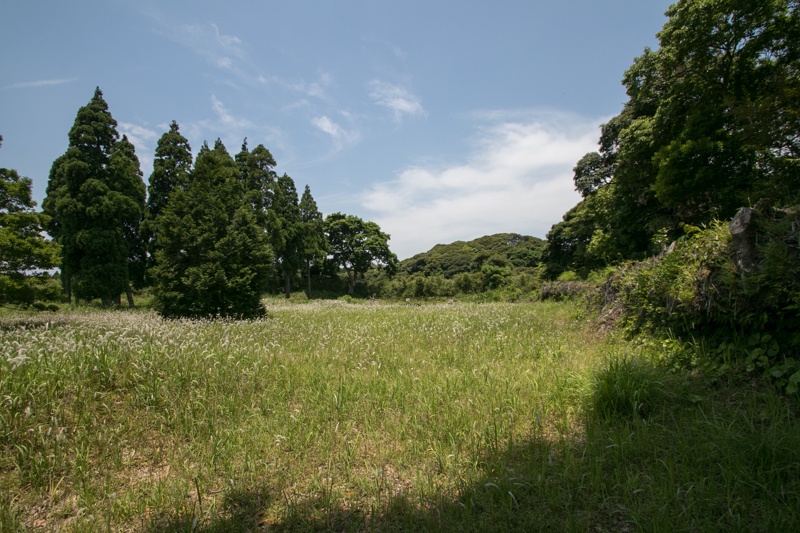 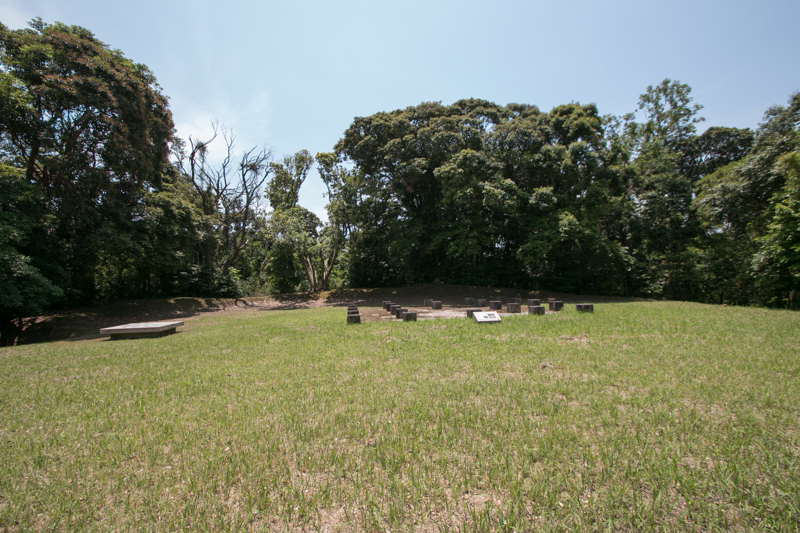 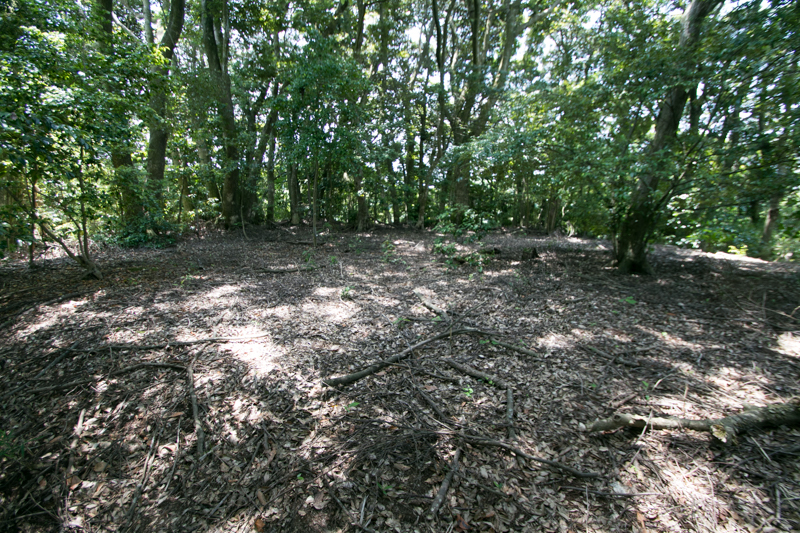 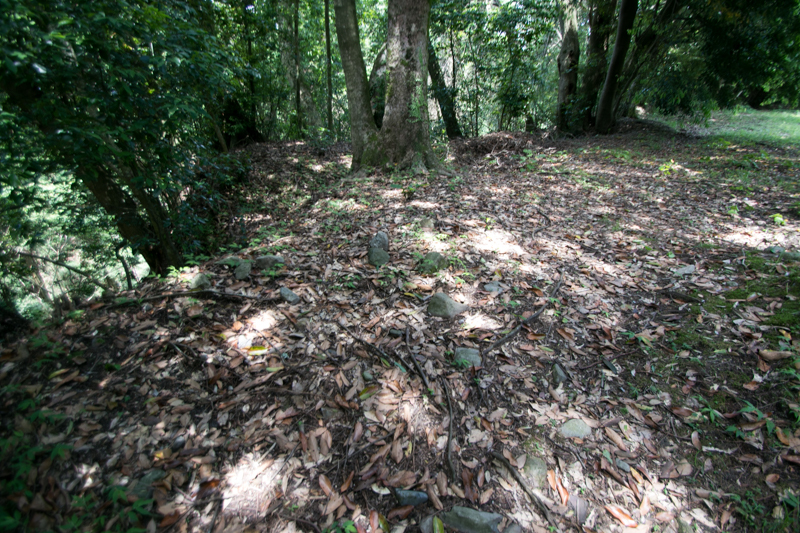 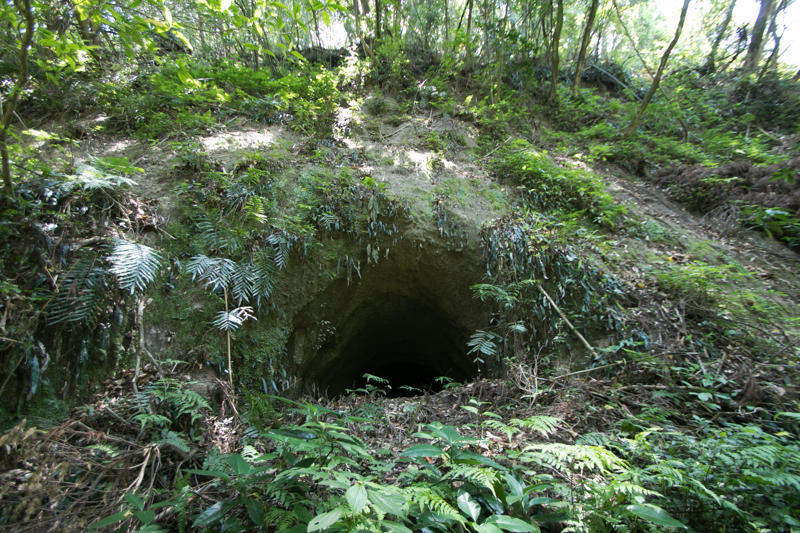 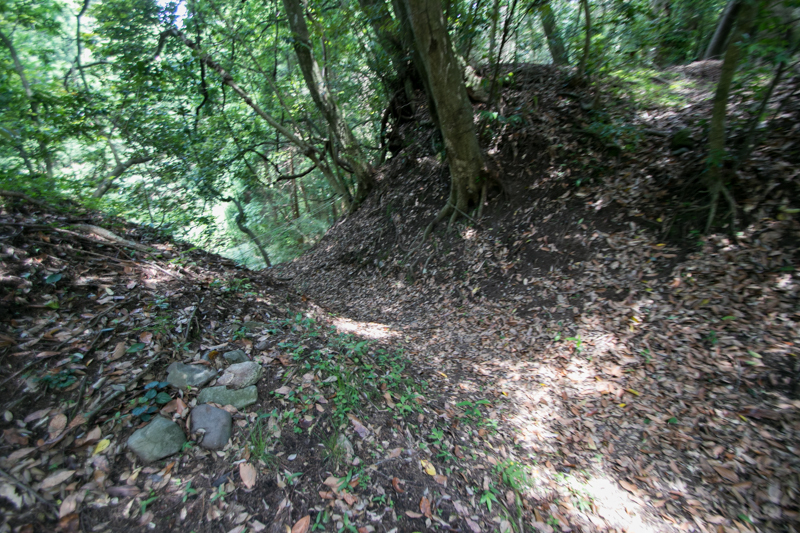 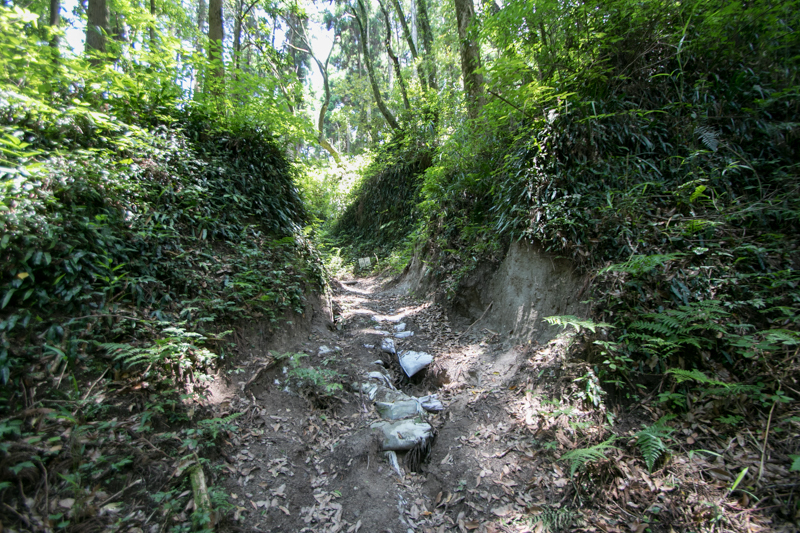 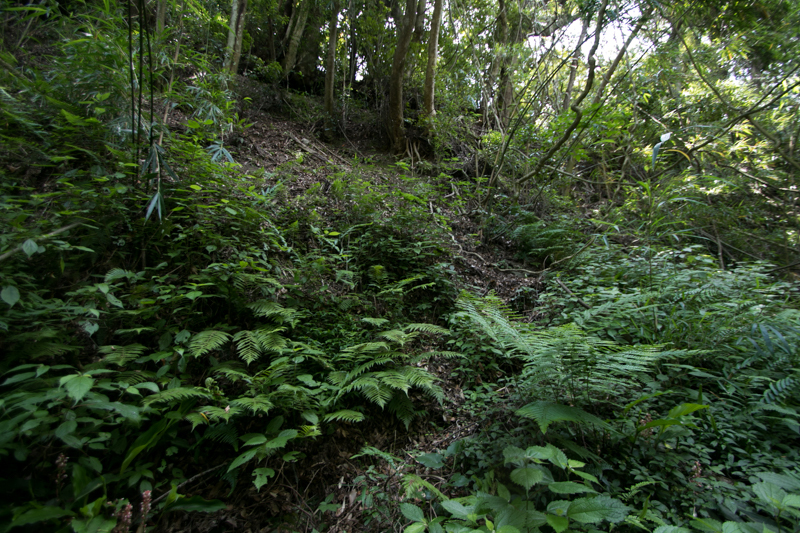 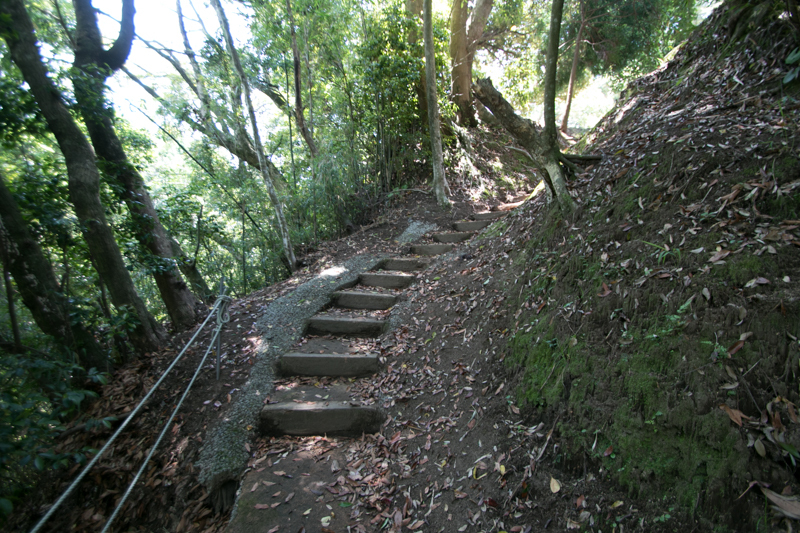 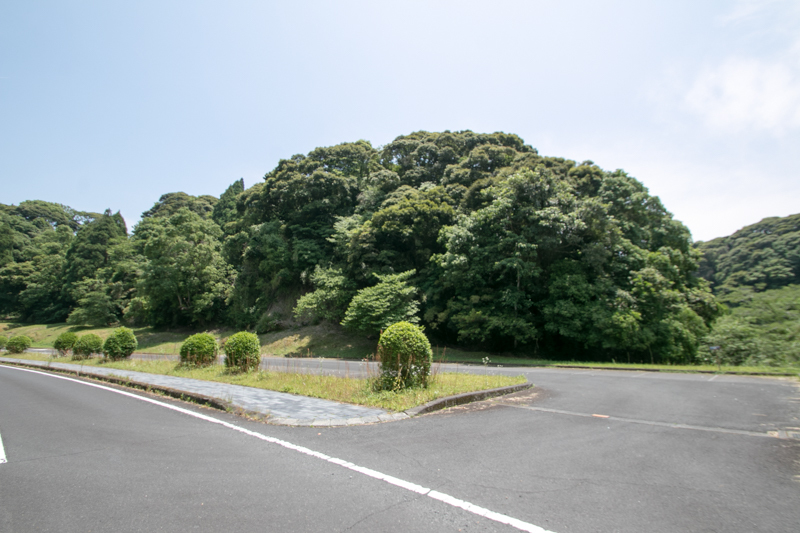 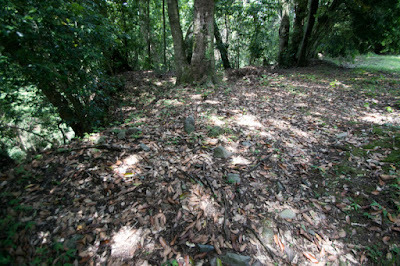 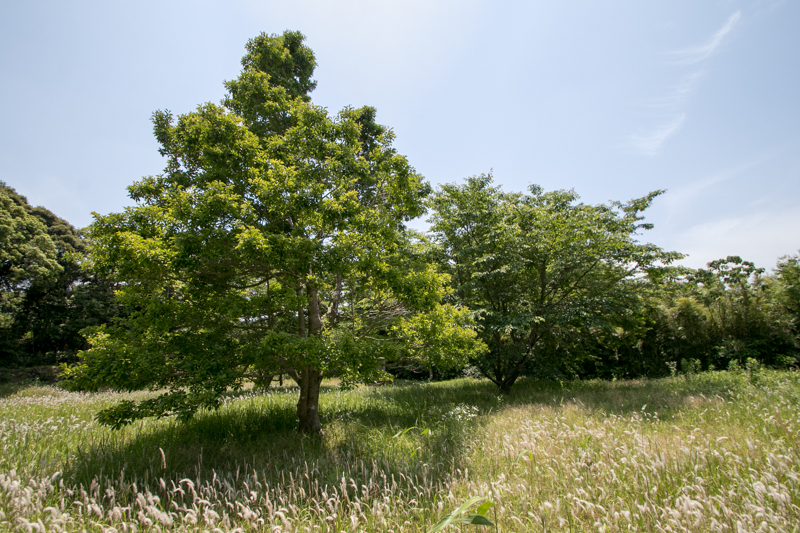 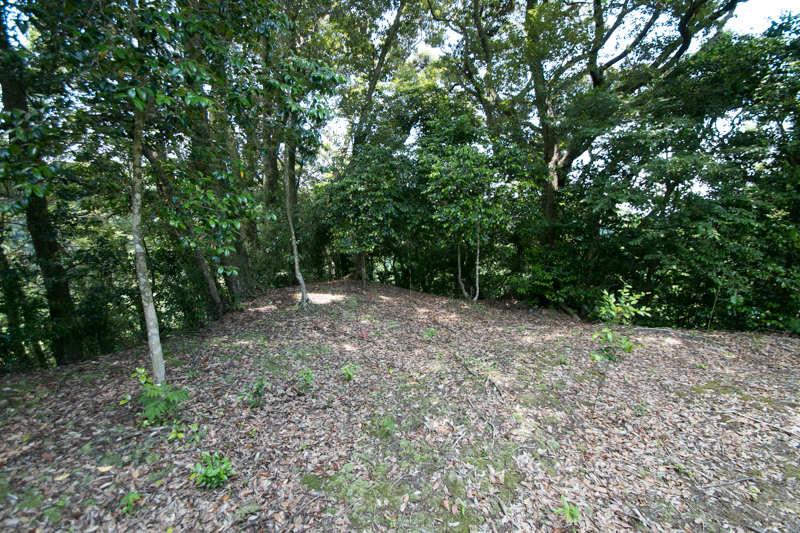 At the south edge of Kyushu island there were many castle utilizing such ground condition, but Chiran castle was a most typical one along with Shibushi castle (Kagoshima prefecture) at Osumi peninsula. 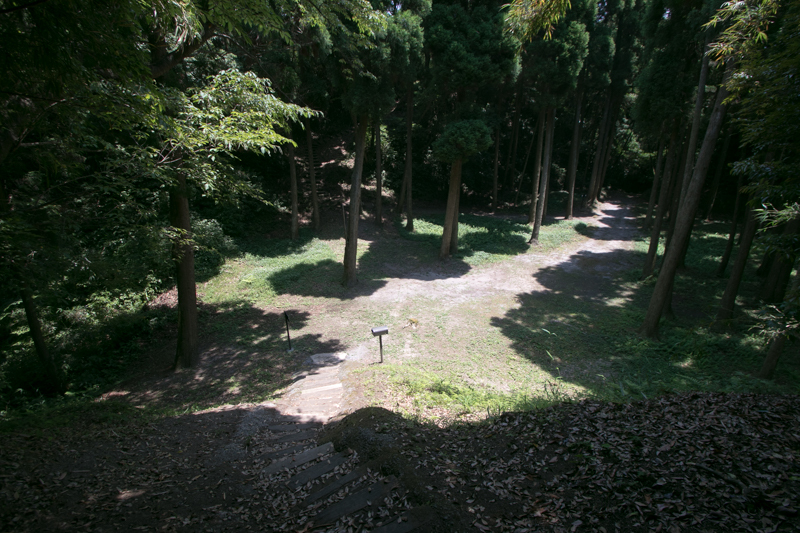 Sometimes this type of the castle is just a group of independent terraces, which reflects decentralized structure of each clan. 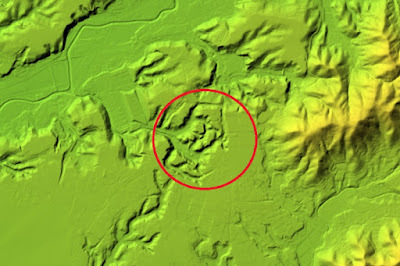 But at Chiran castle, central area is roughly divided into north half and south half by huge valley, and it seems an effort to unite independent terraces and build a defense line. 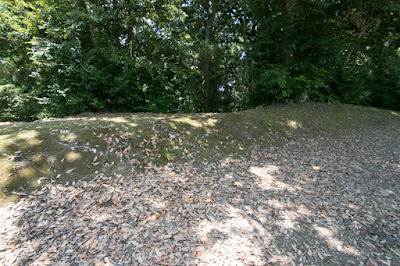 Central area of the castle is a square shaped one of 50 meter long, at the east edge of north half. 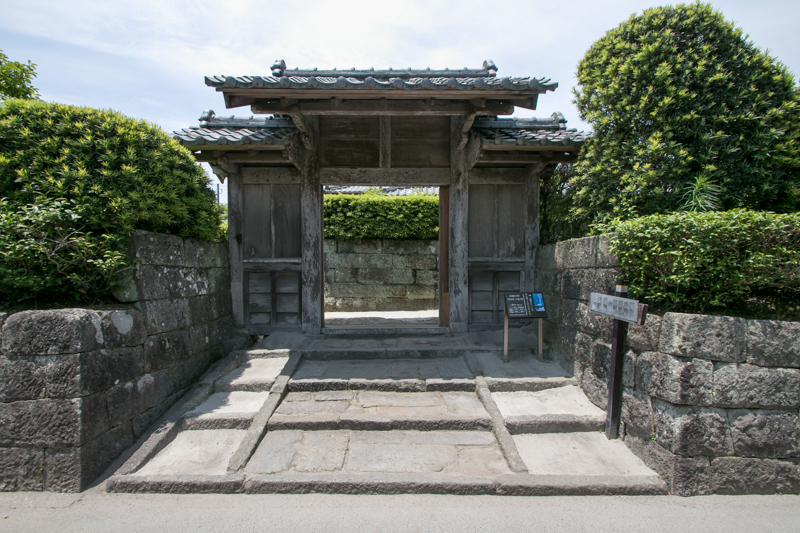 Each line of the area is protected by clay wall, and the entrance is built as a masugata gate, a composite one with buffer area style. 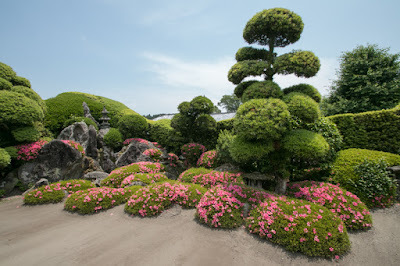 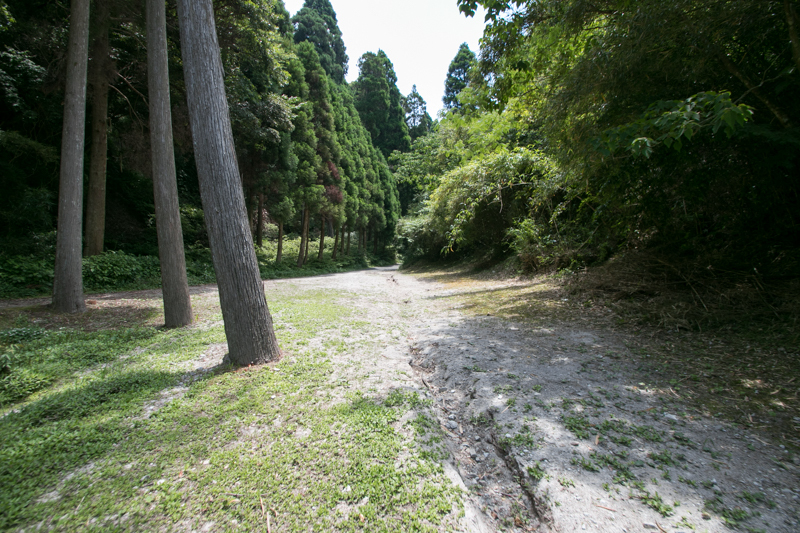 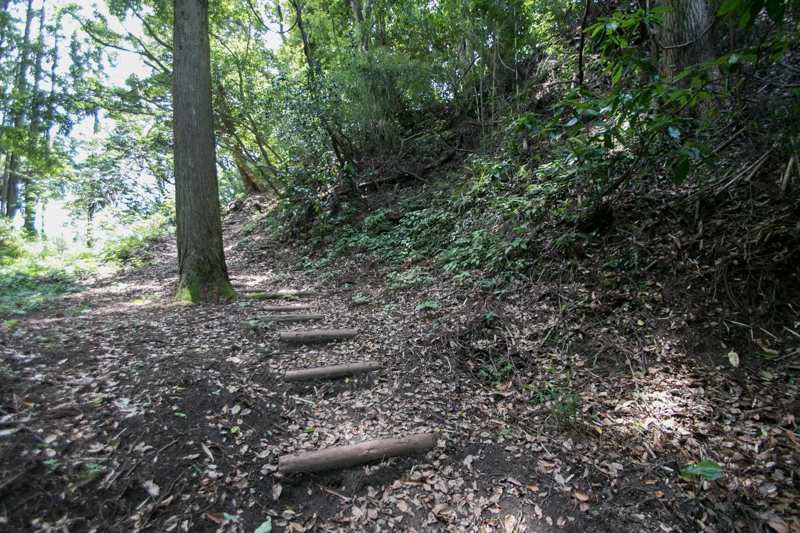 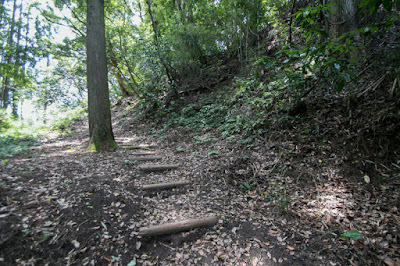 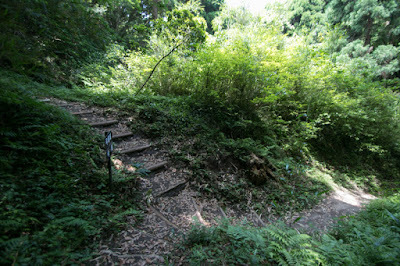 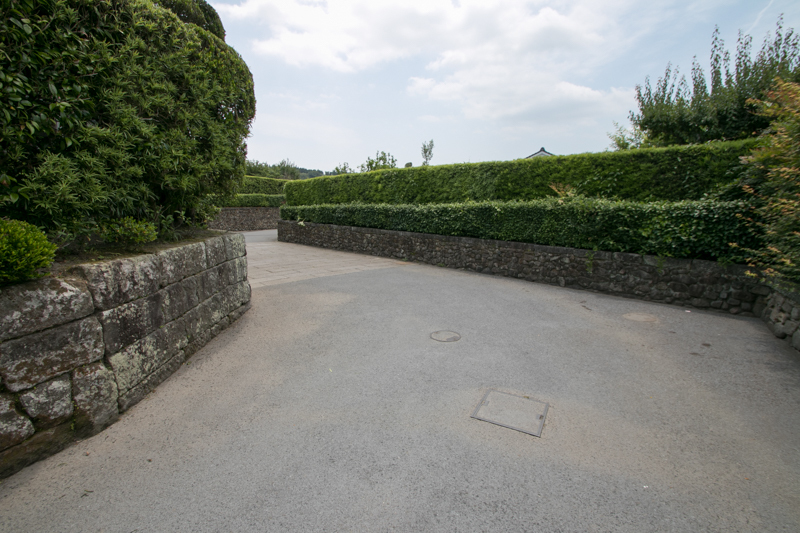 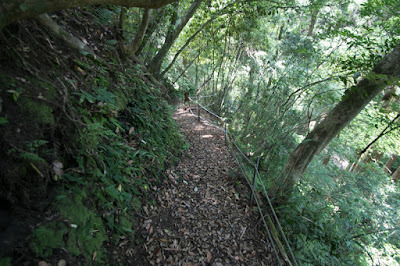 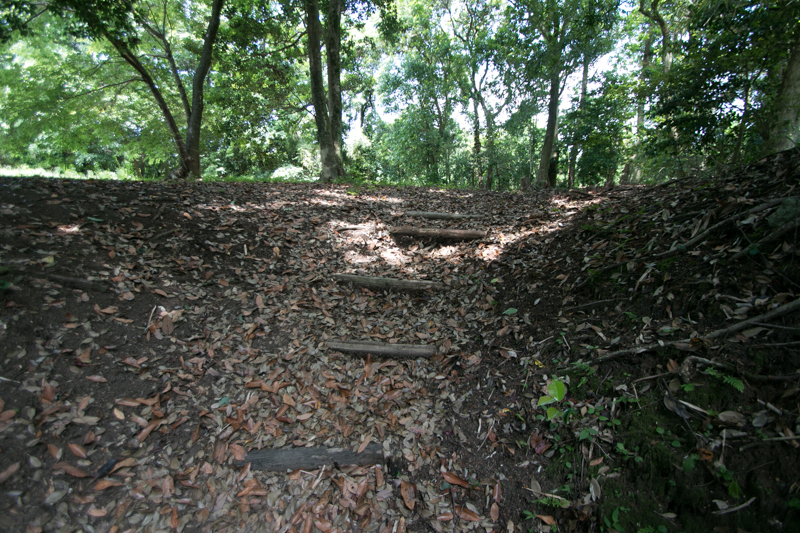 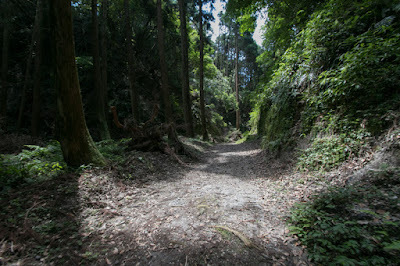 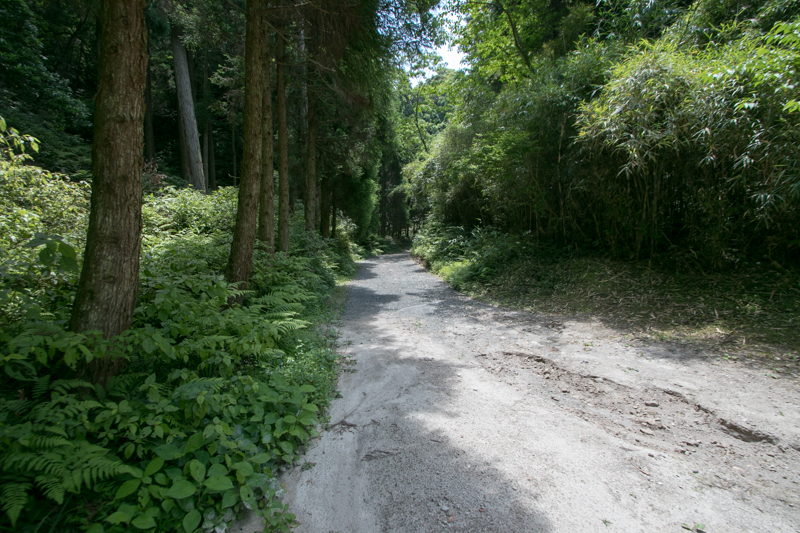 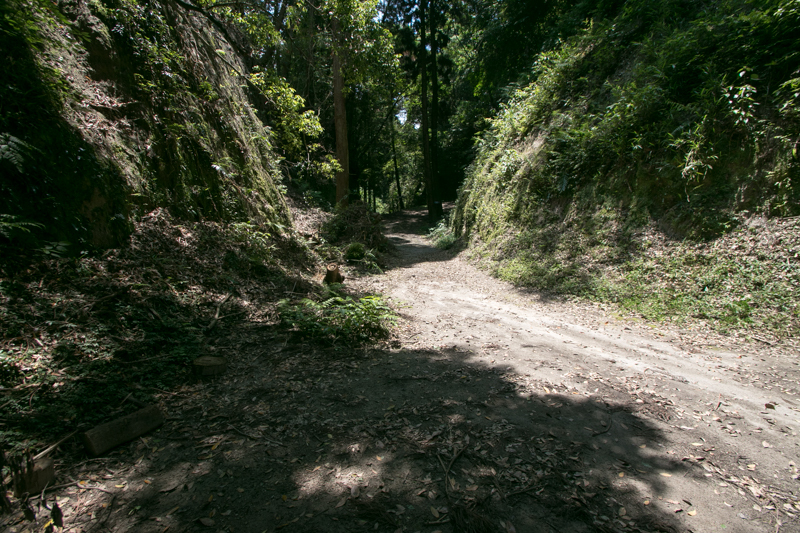 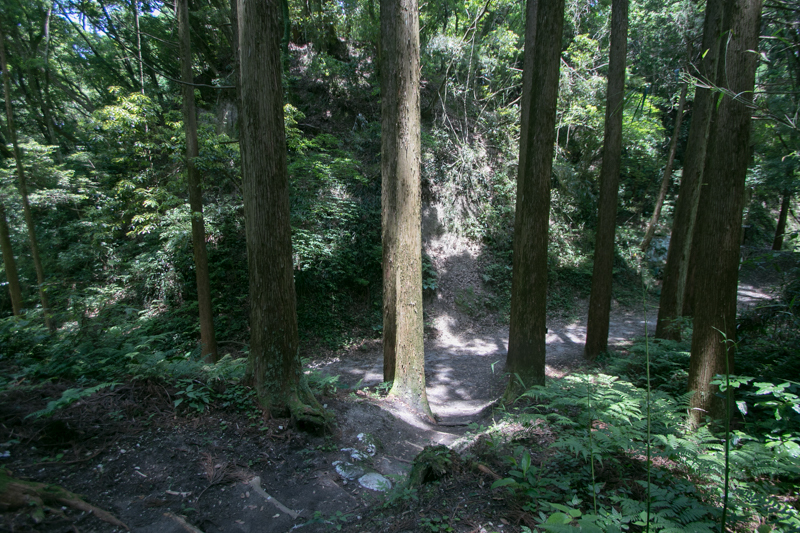 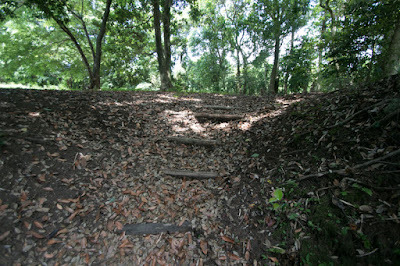 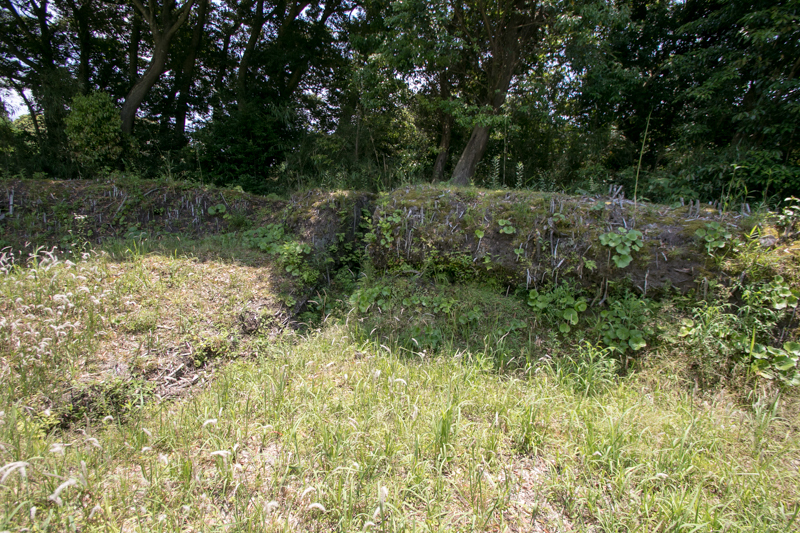 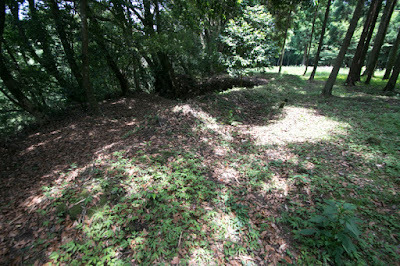 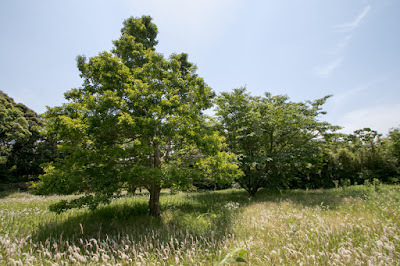 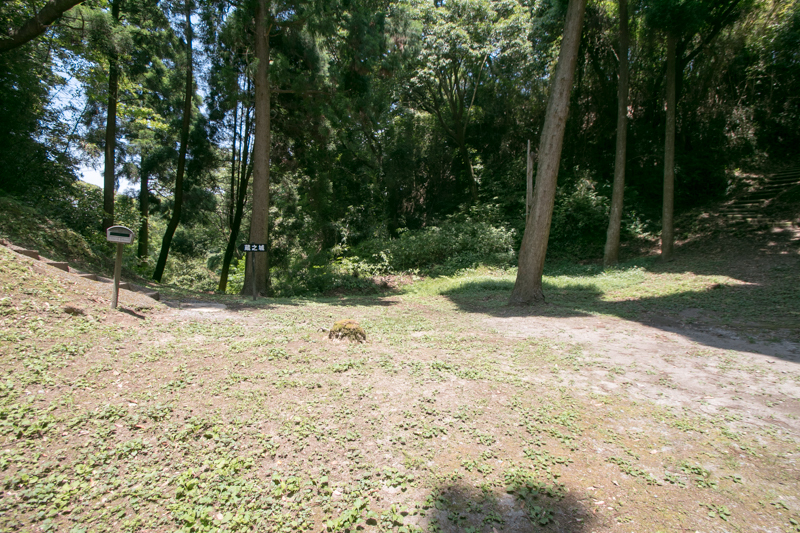 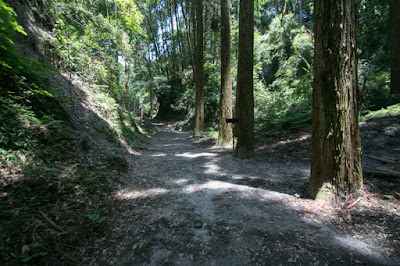 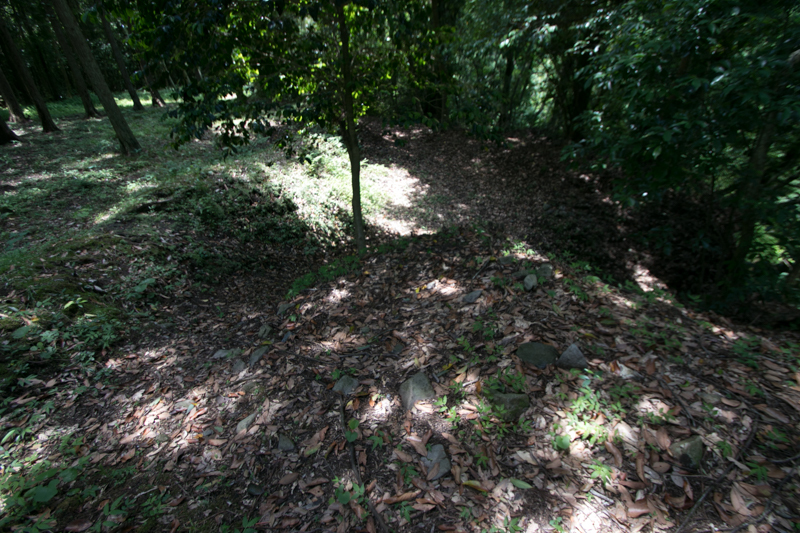 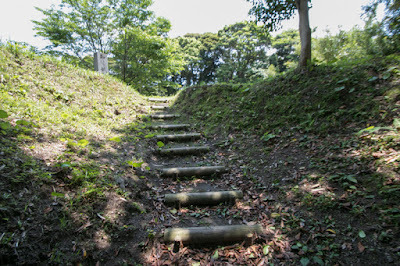 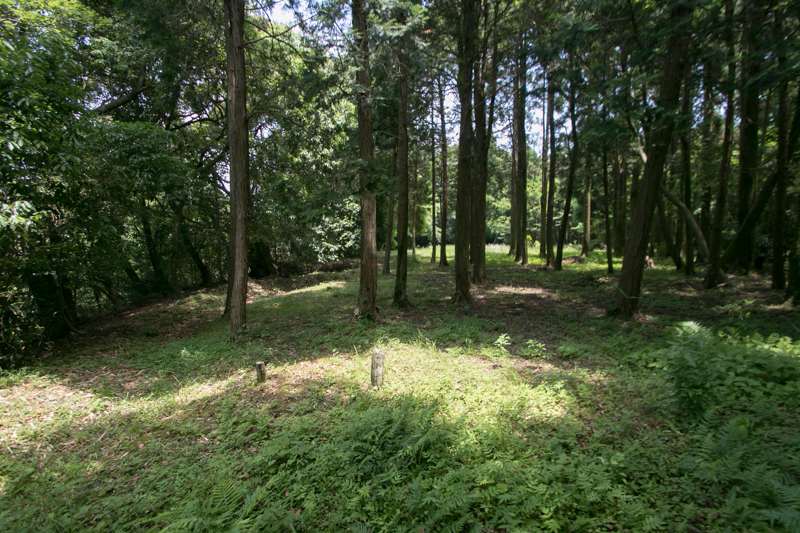 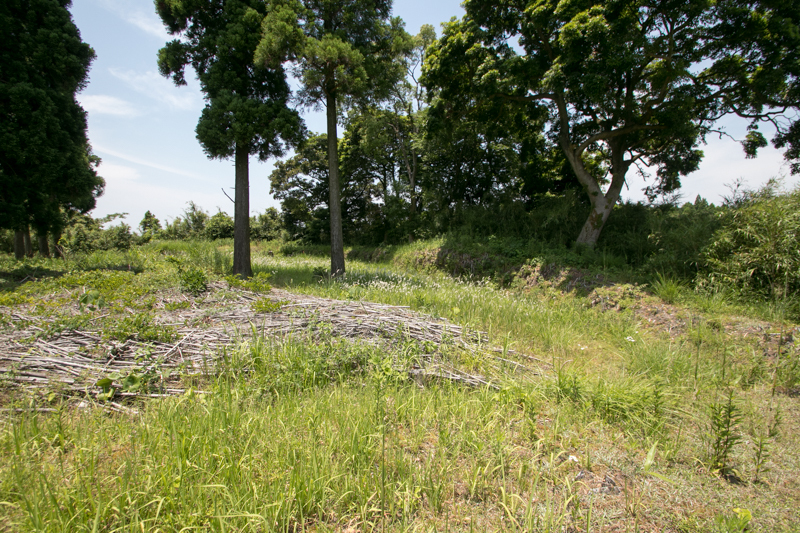 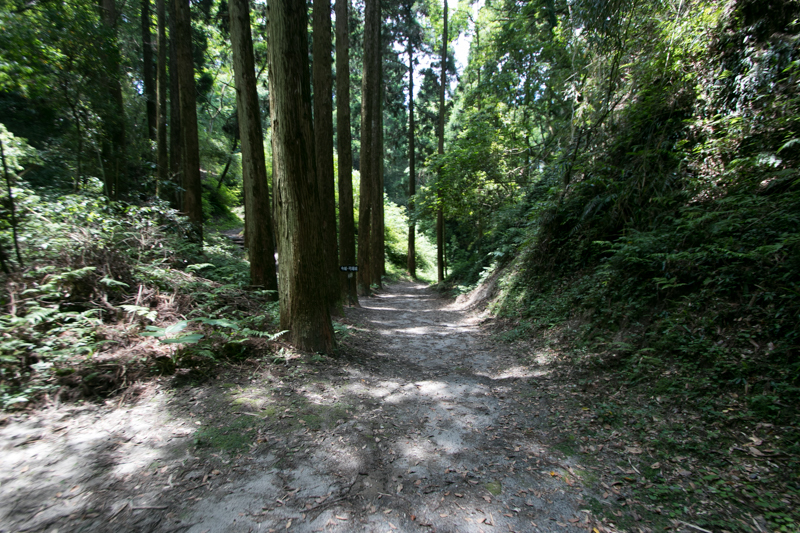 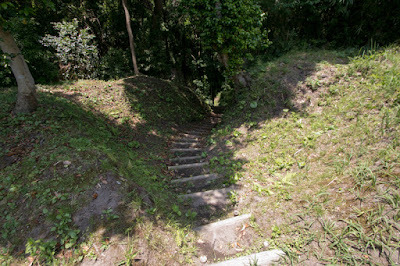 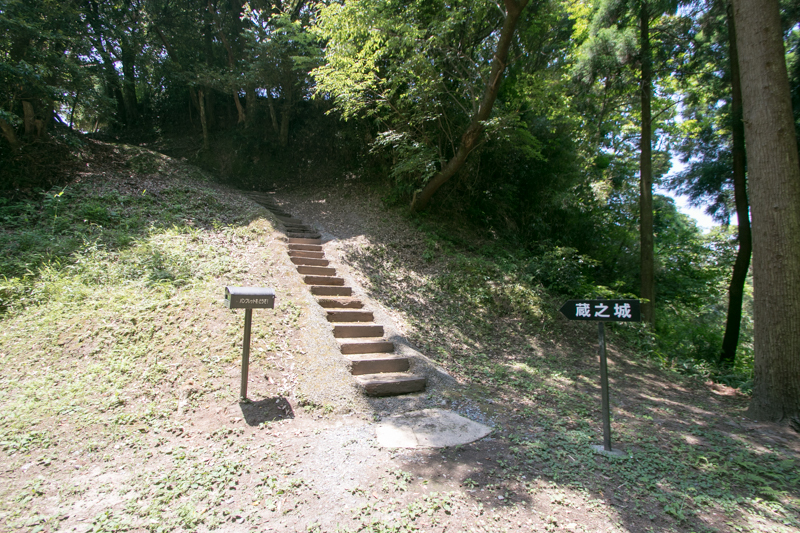 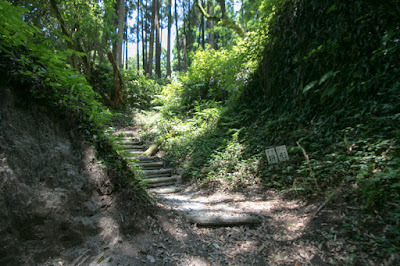 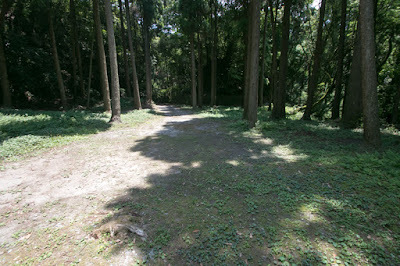 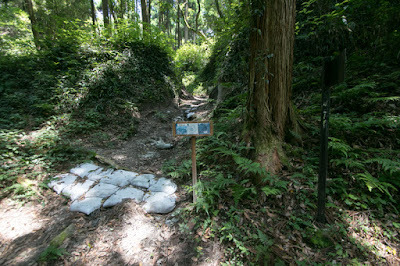 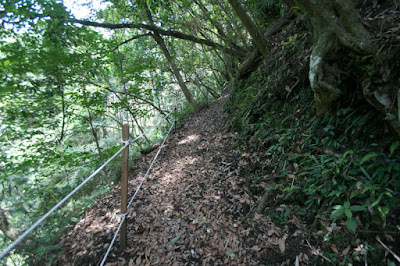 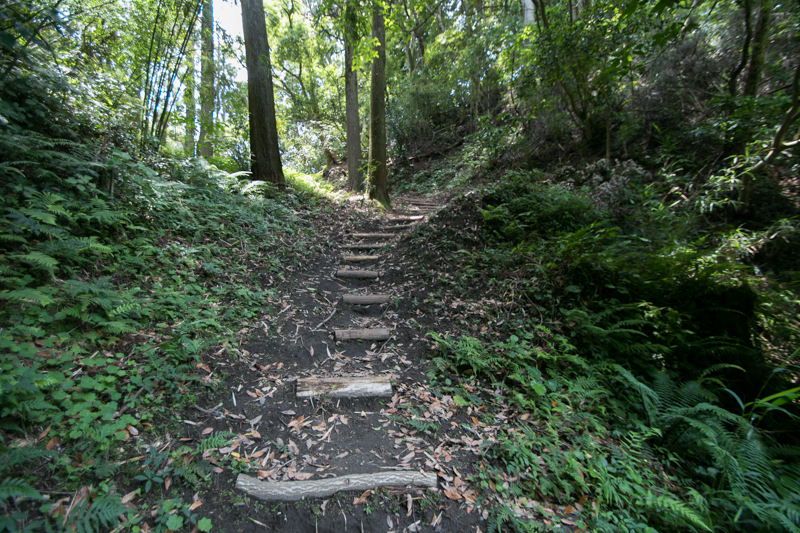 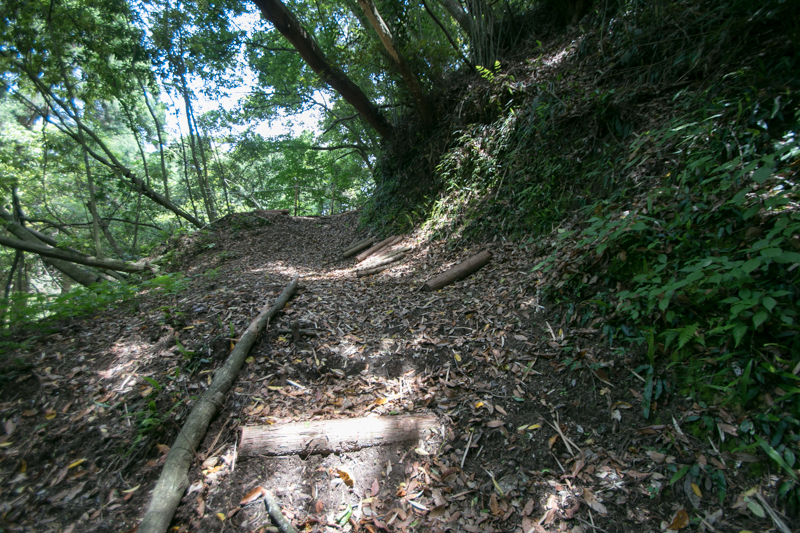 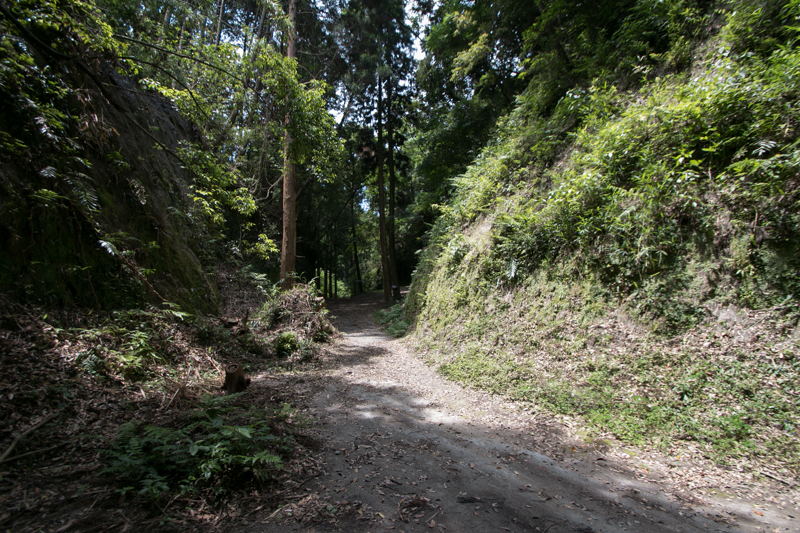 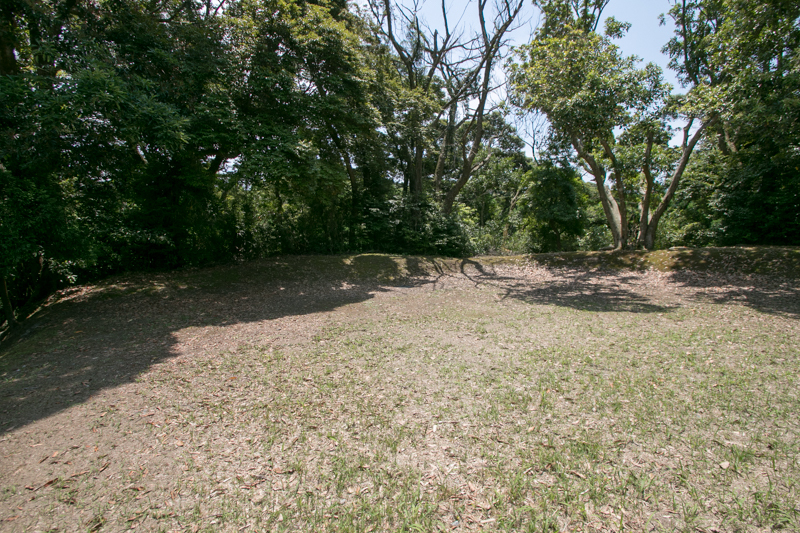 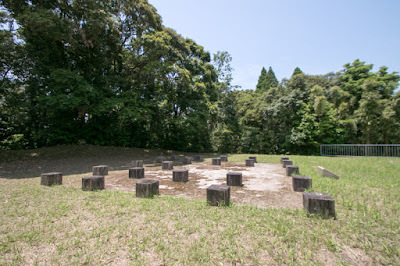 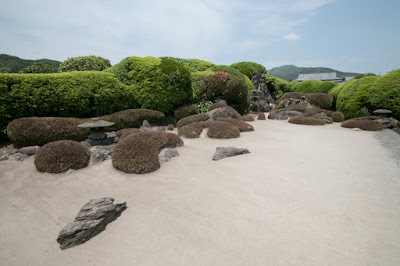 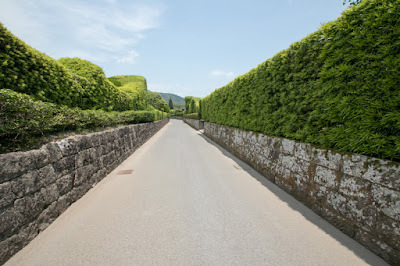 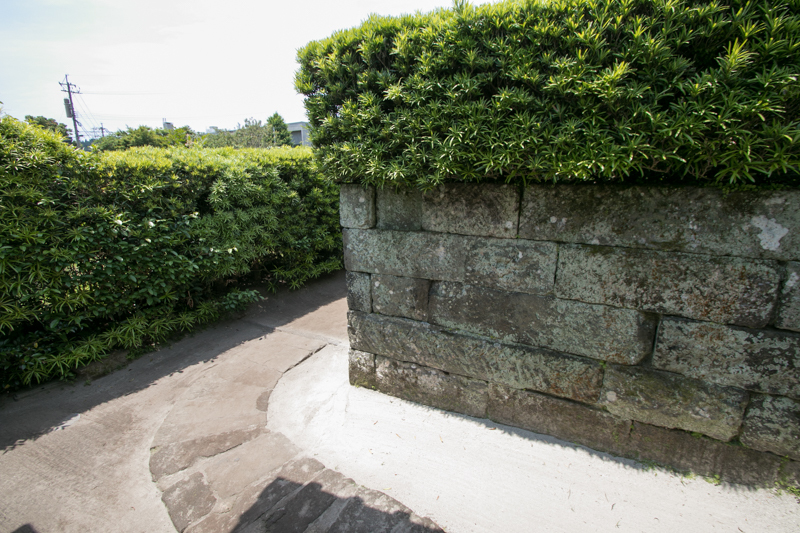 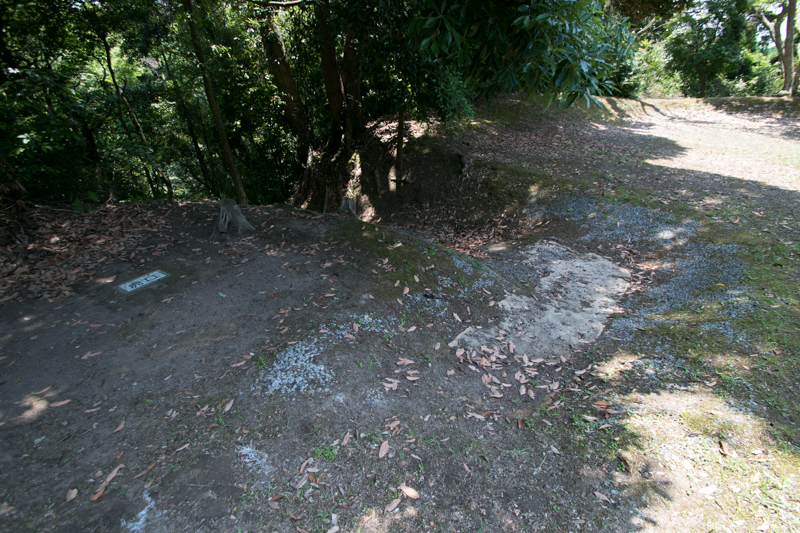 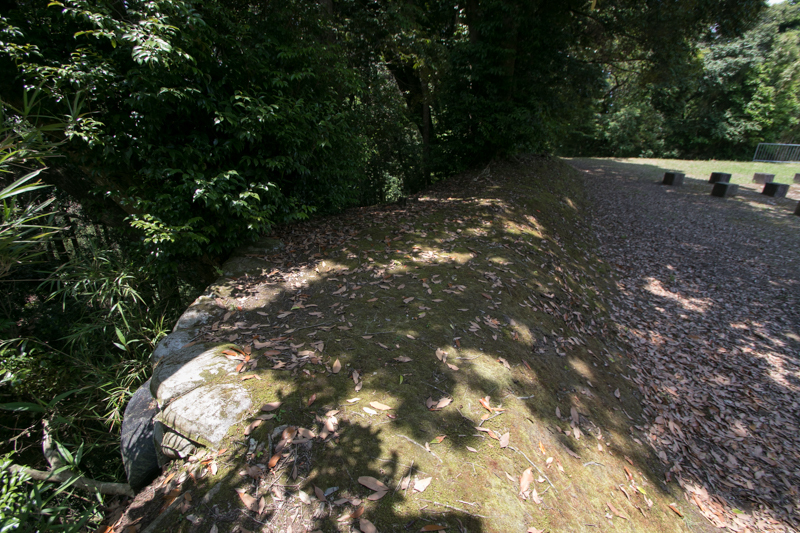 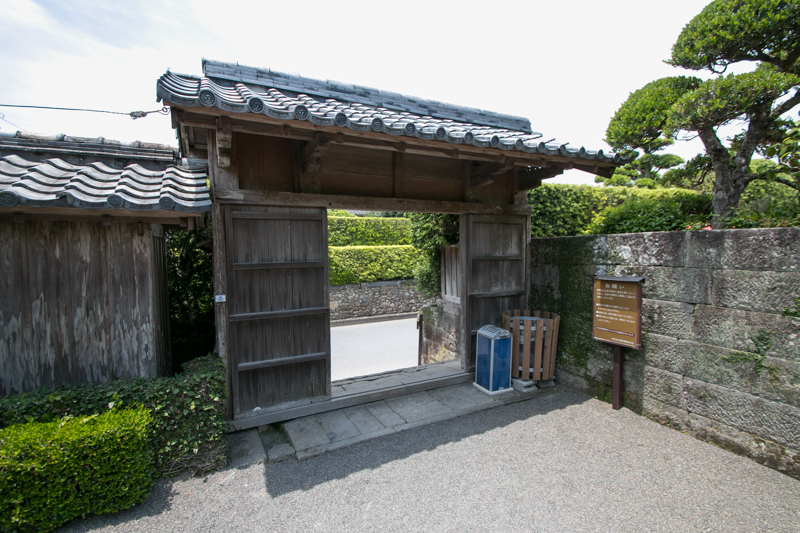 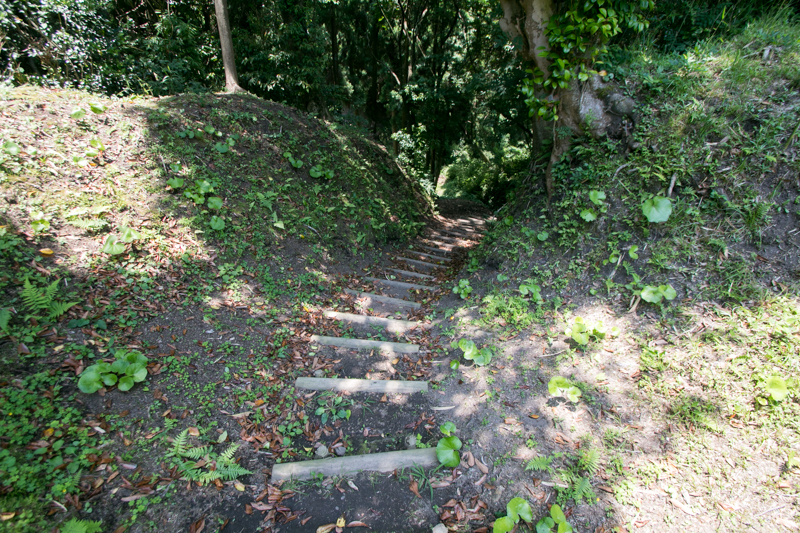 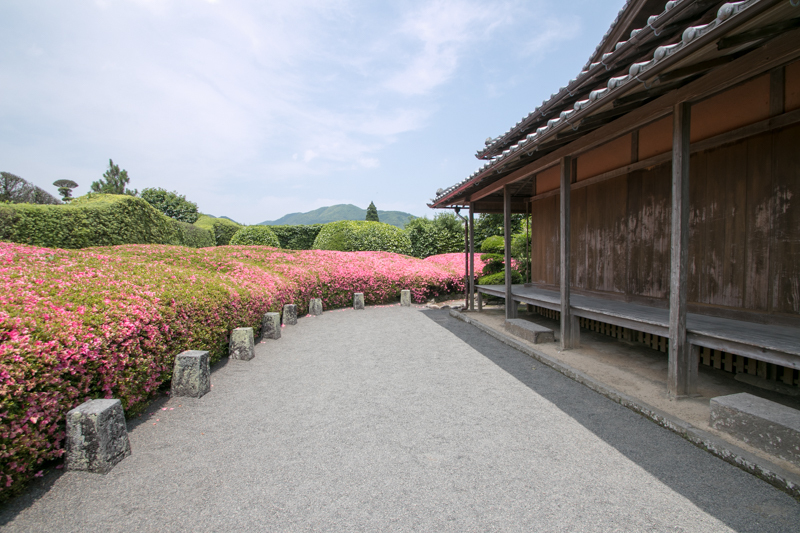 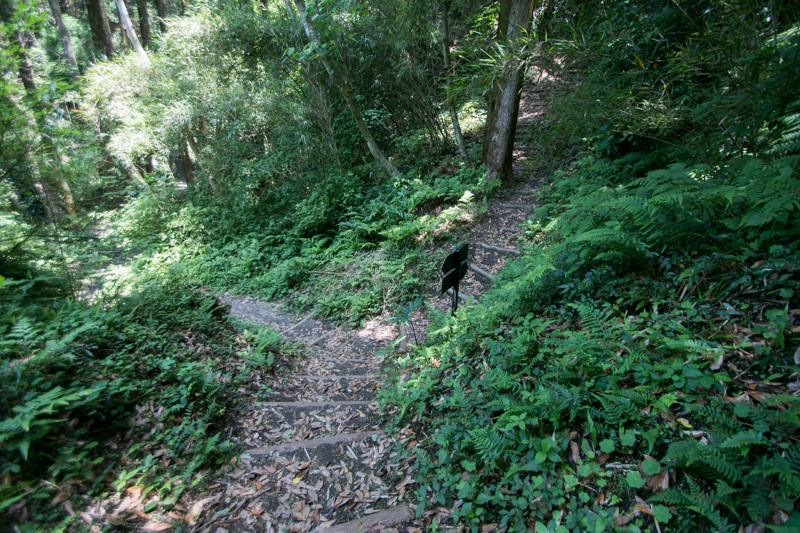 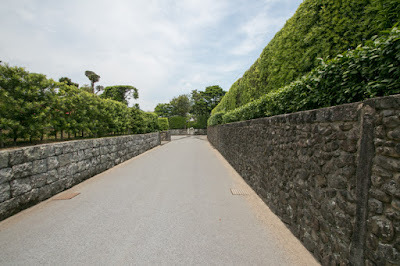 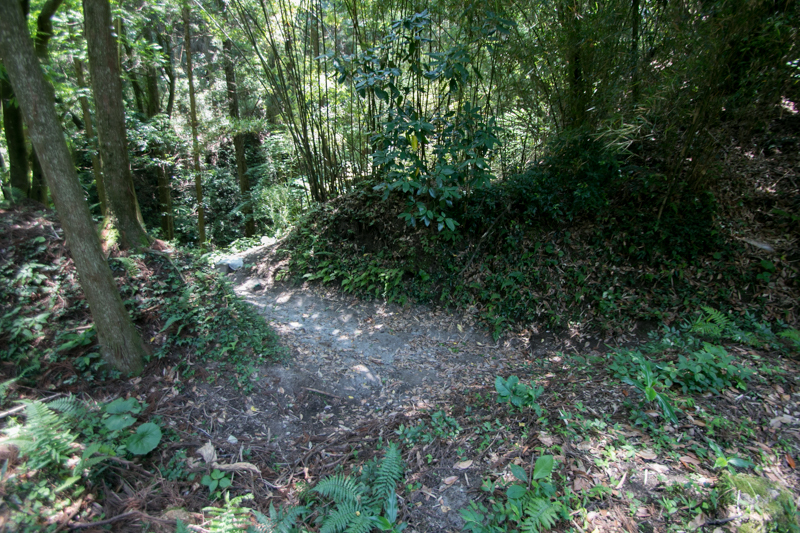 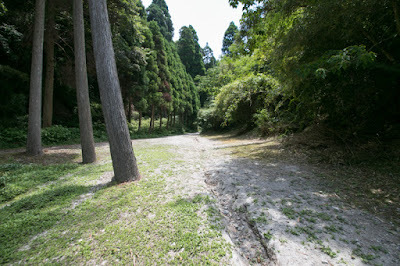 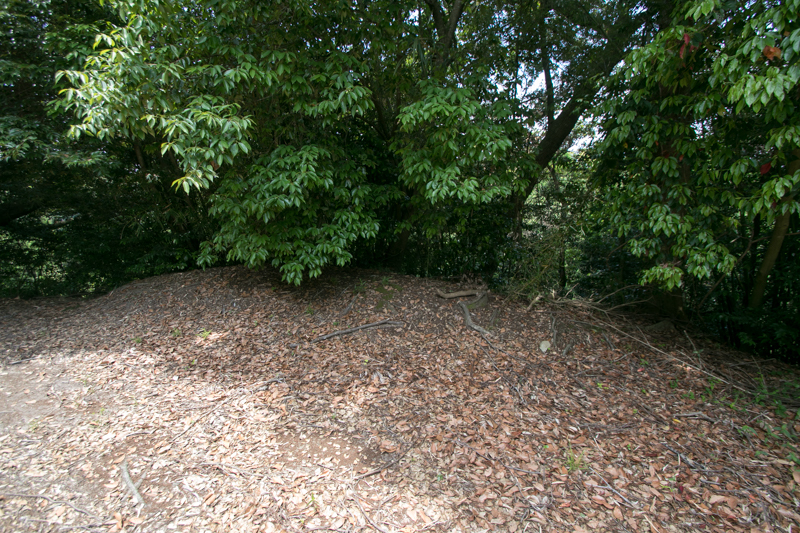 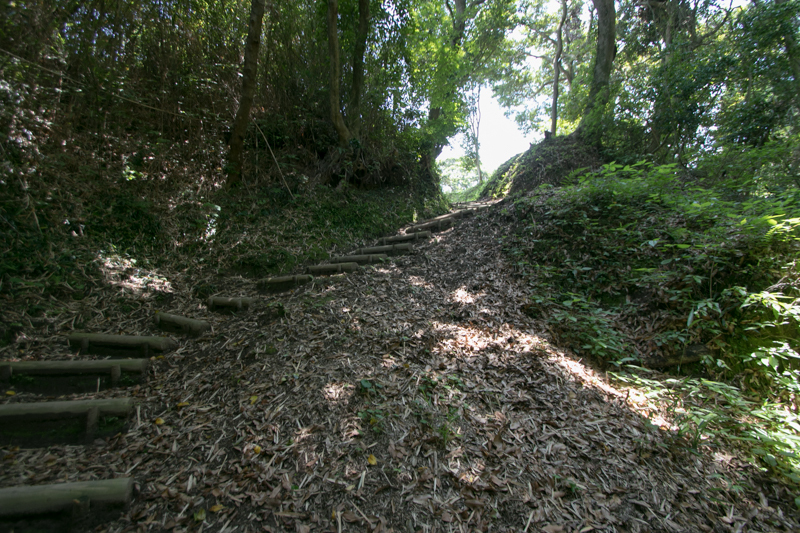 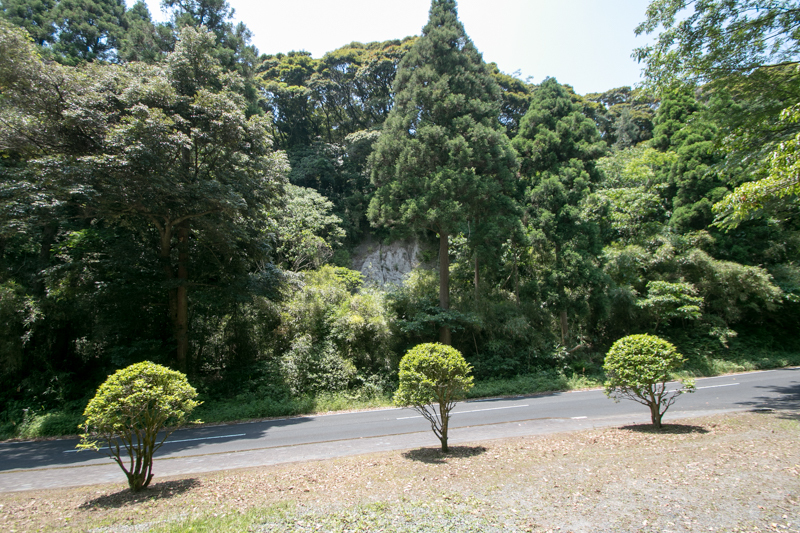 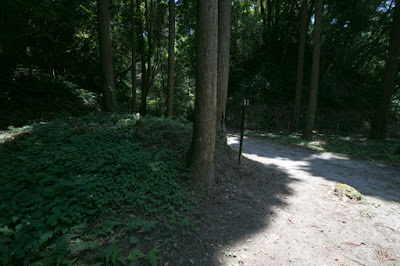 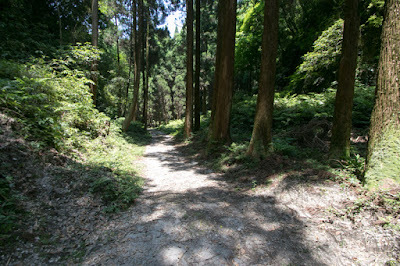 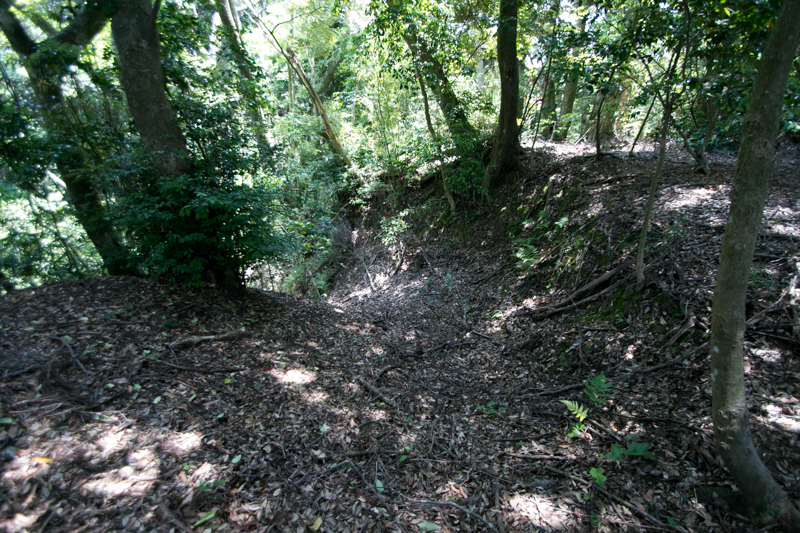 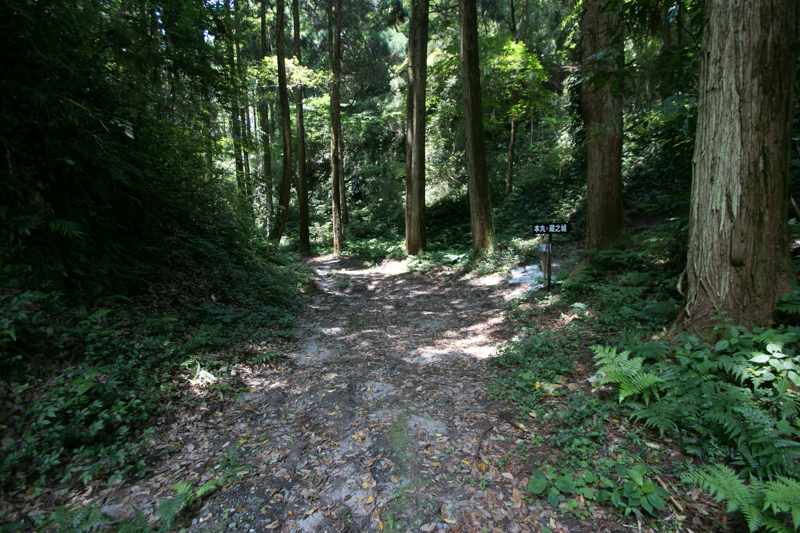 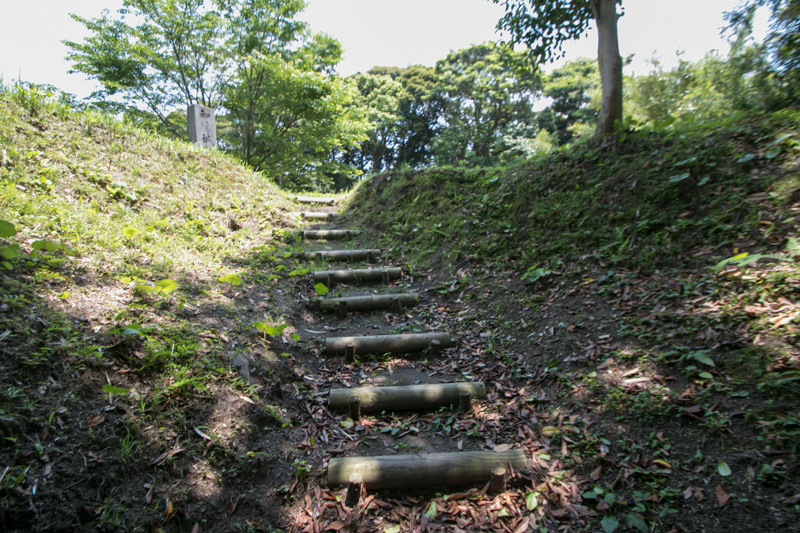 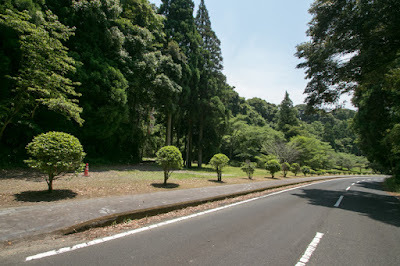 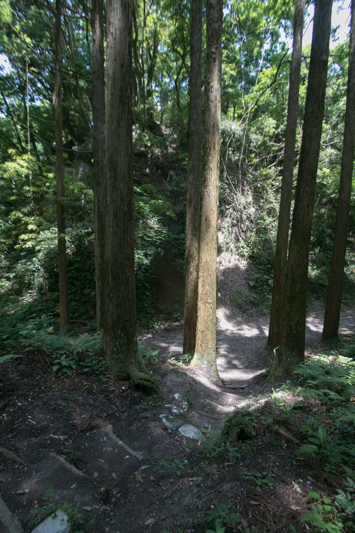 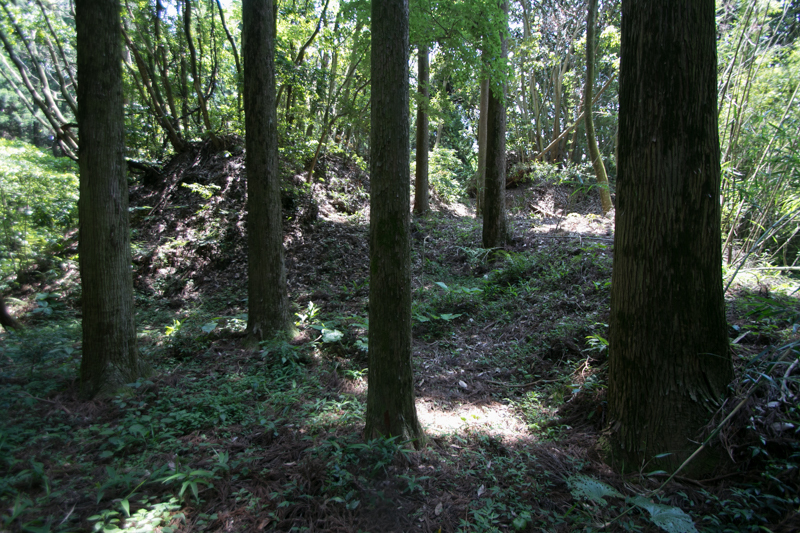 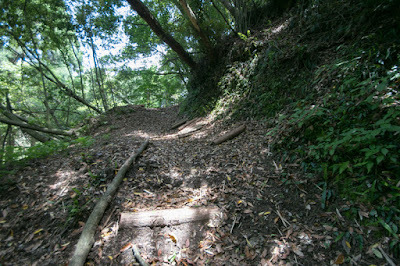 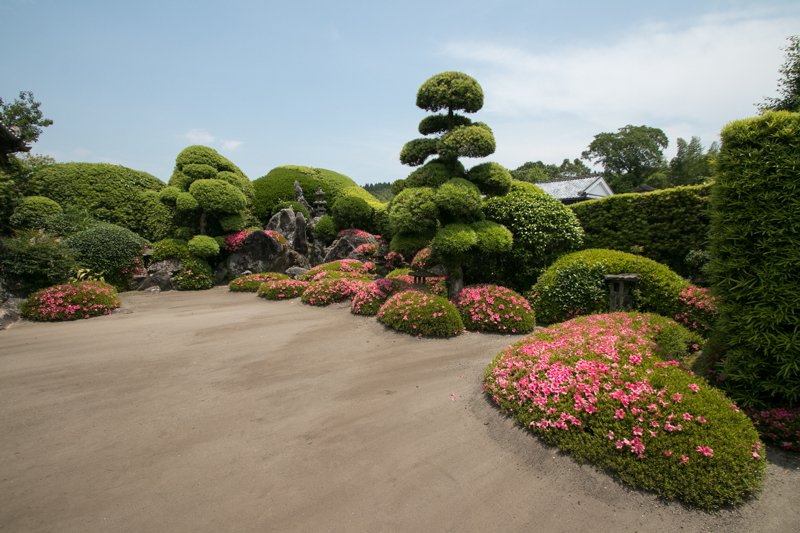 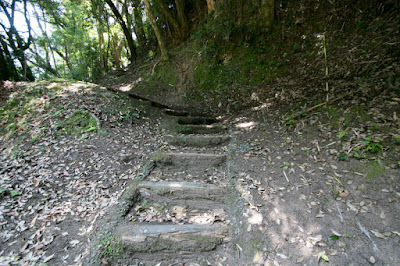 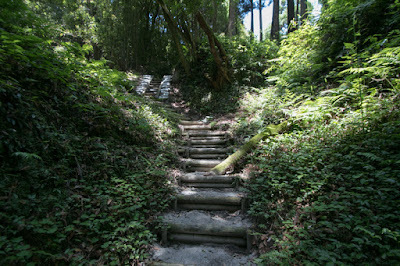 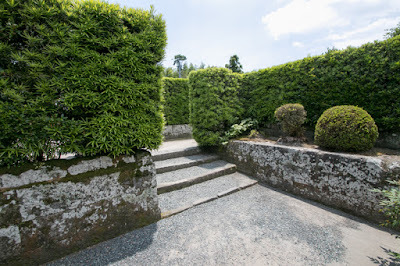 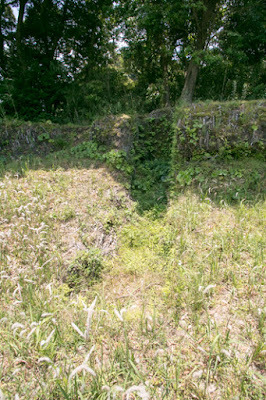 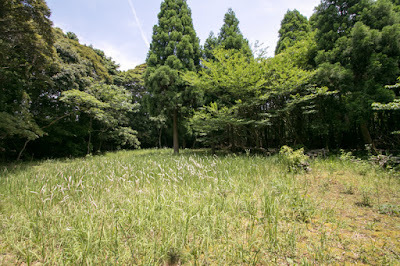 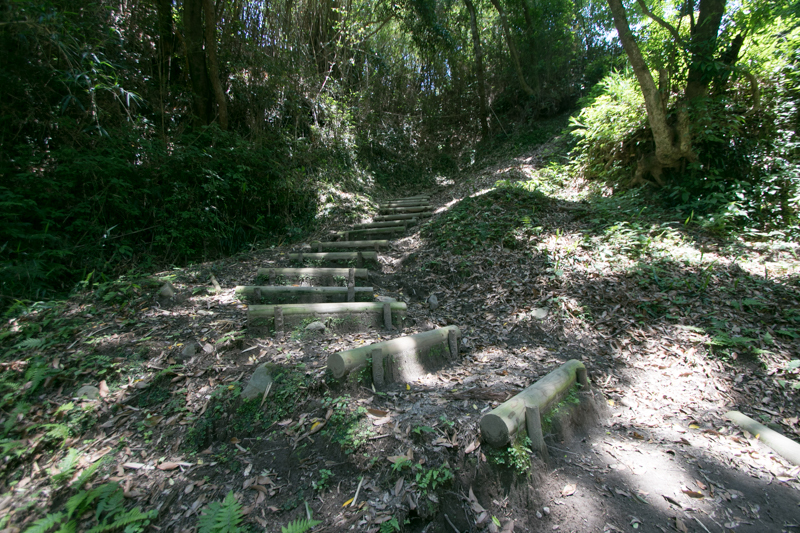 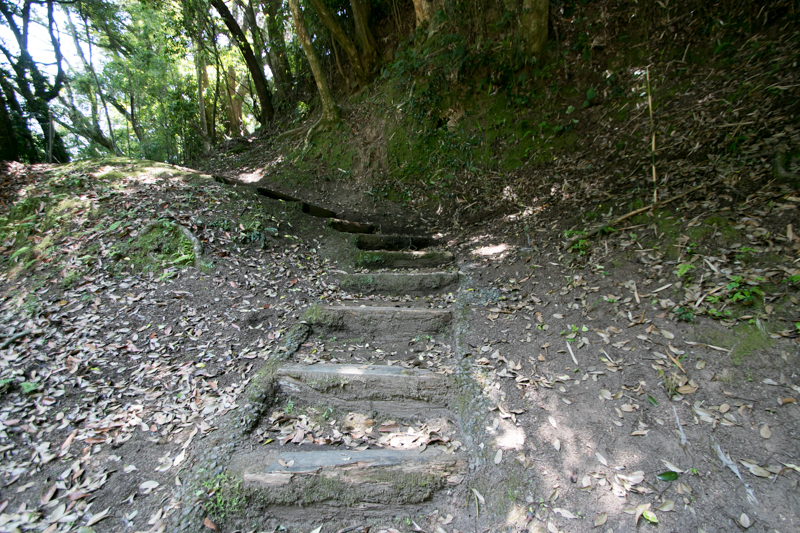 At the west of central area, there is a middle layer terrace which connects central area and Kuranojo area, which also had a masugata style gate with folded path, which was affected by castles of central area. 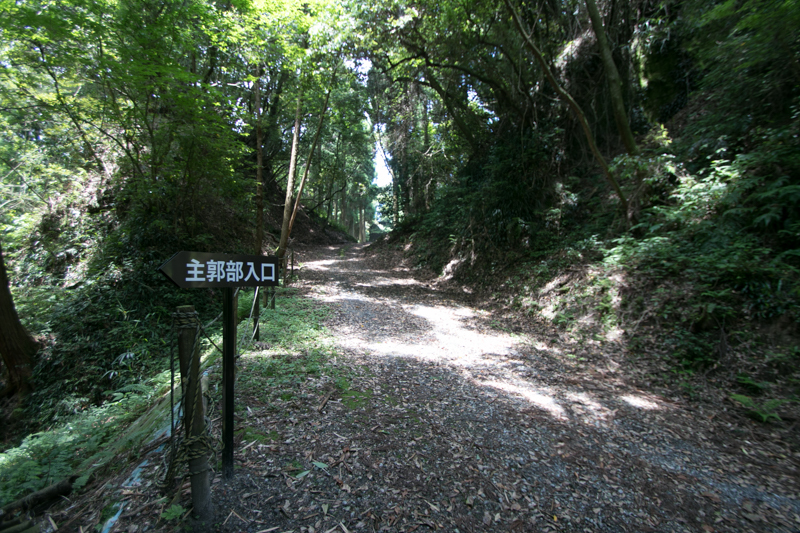 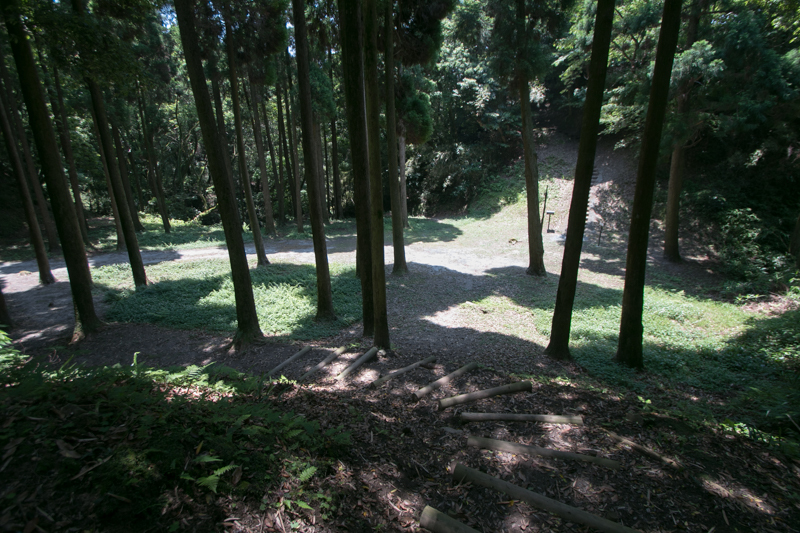 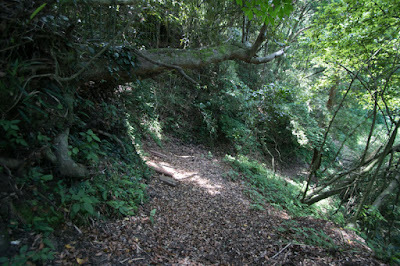 Kuranoshiro area is an important area to control the main gate at the northwest of the castle. This name means the place of storage, and actually many relics such as Chinese pottery, daily wares or iron wares were found by excavation. 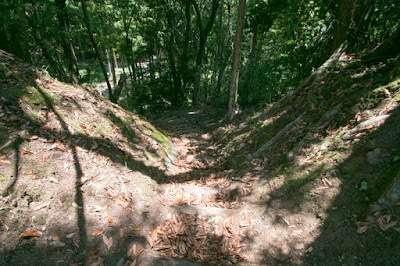 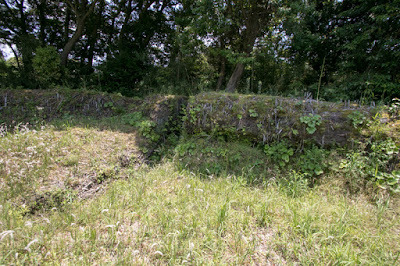 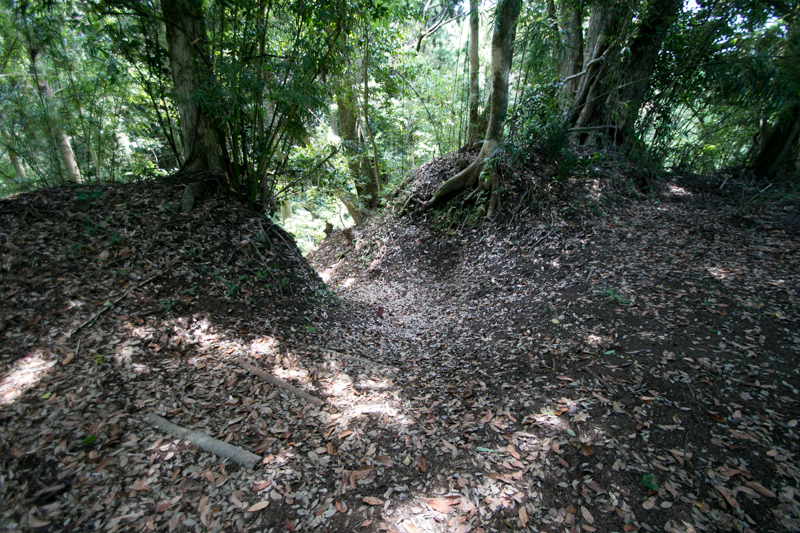 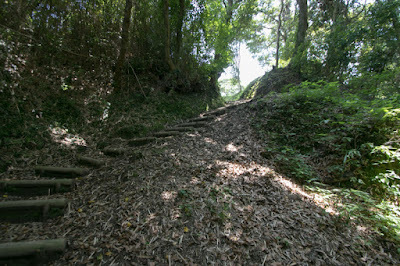 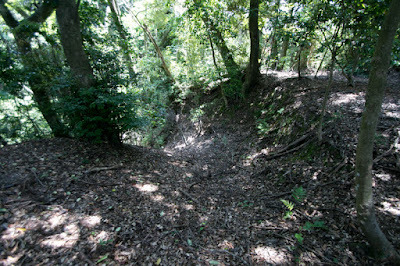 Ahead of Kuranoshiro area, small terraces connected by clay bridges with basement of turret spreads toward the entrance, the most secure structure of the castle. 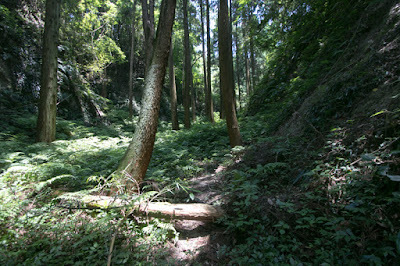 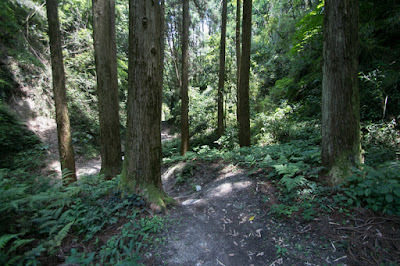 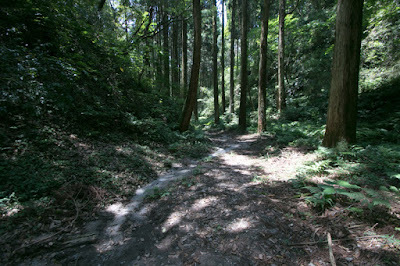 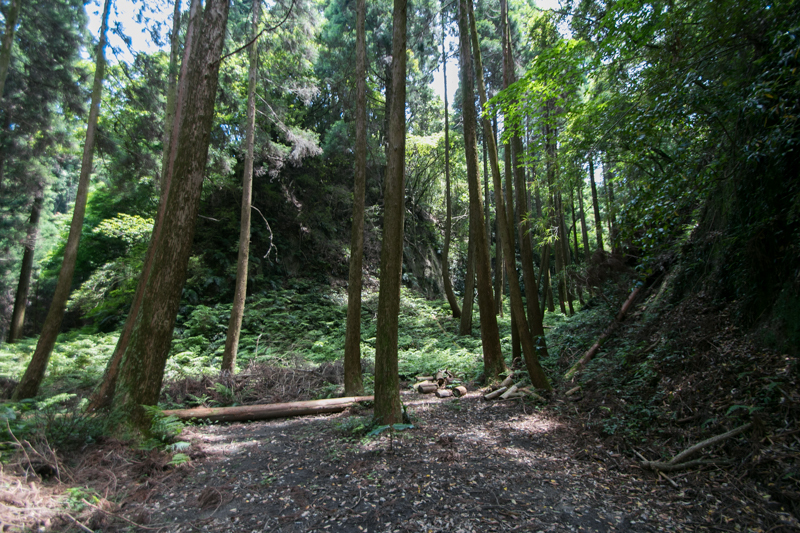 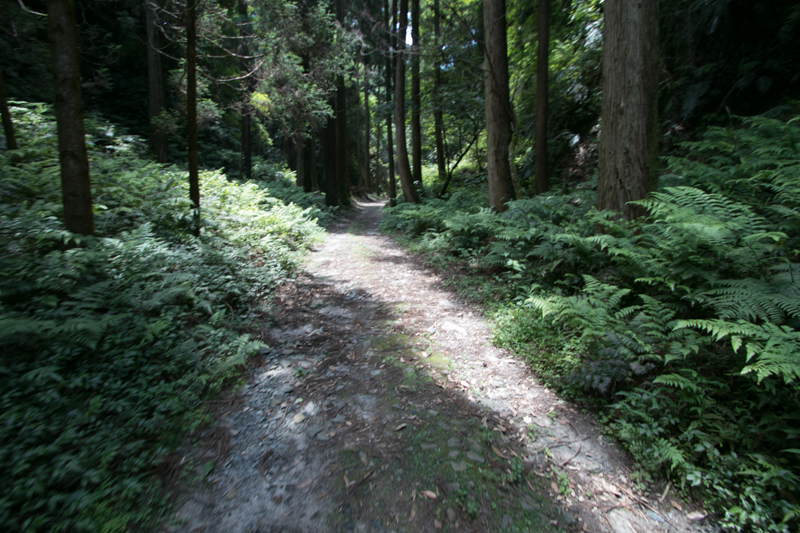 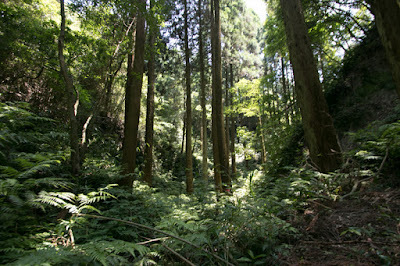 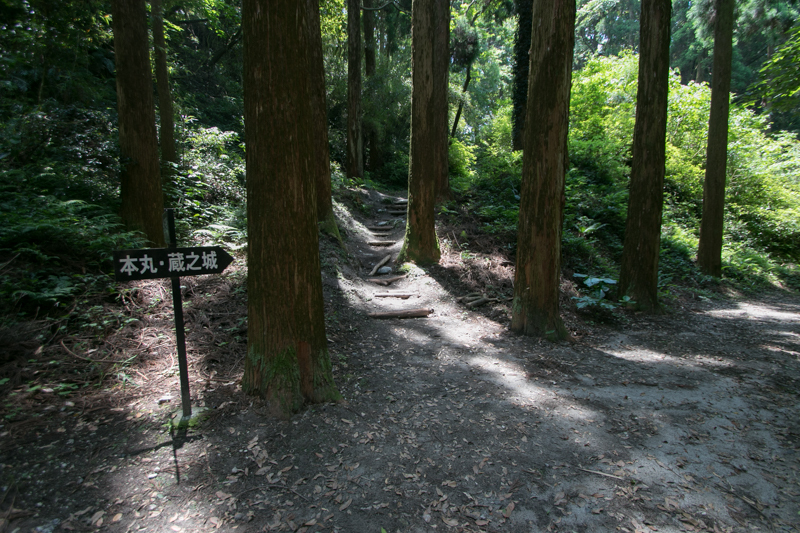 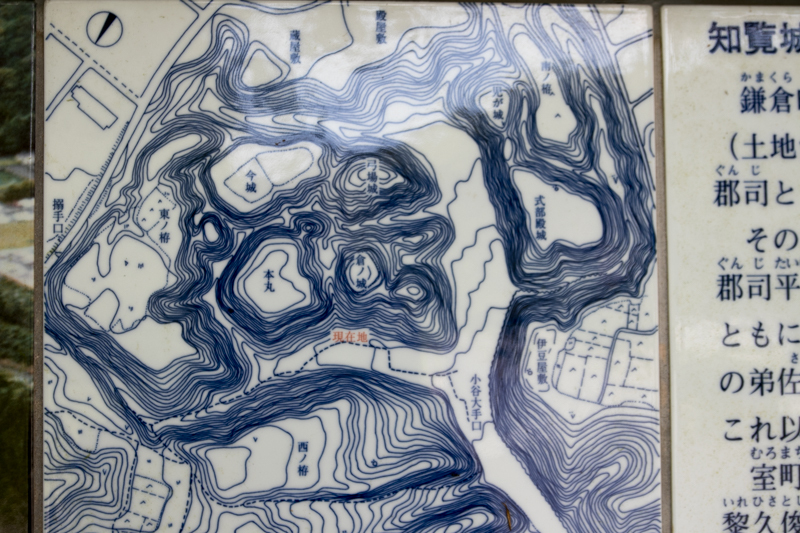 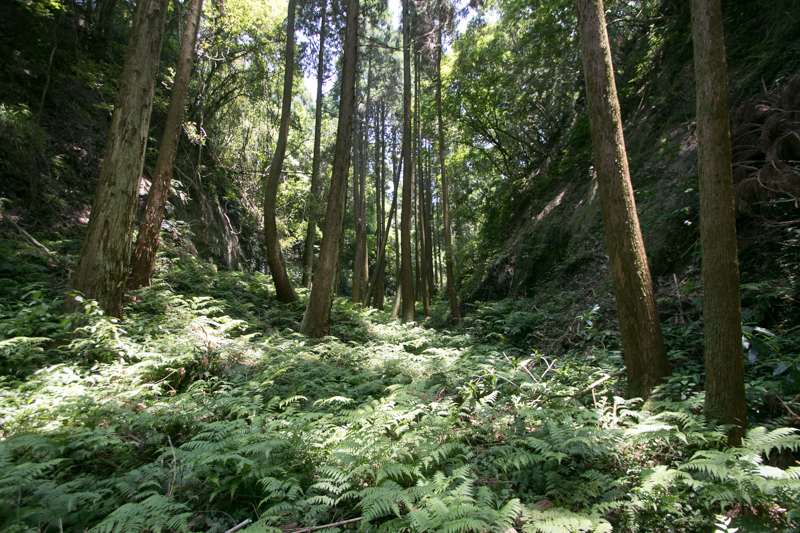 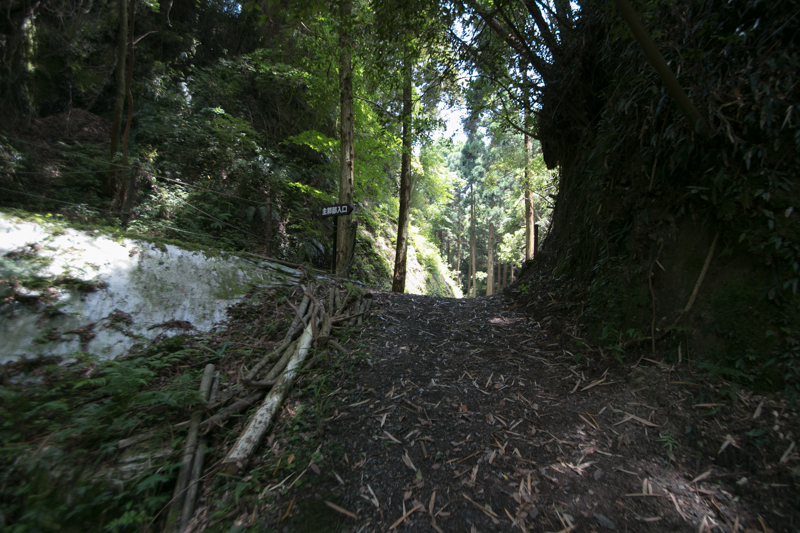 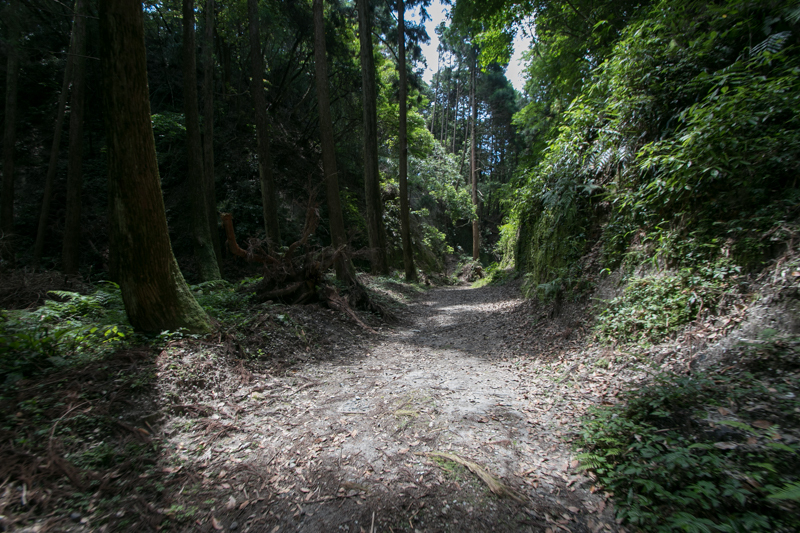 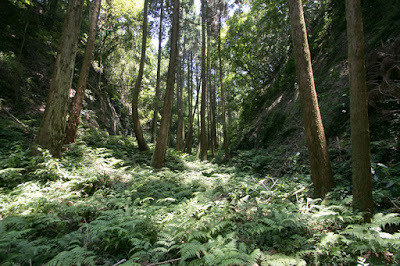 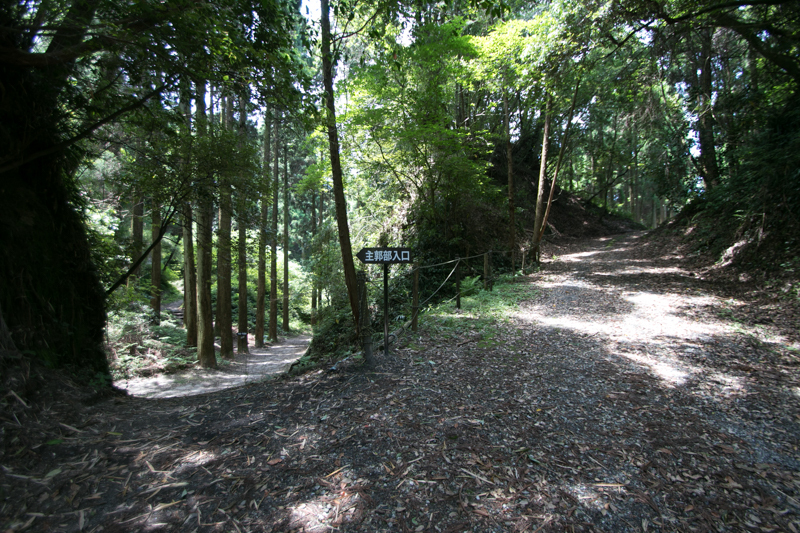 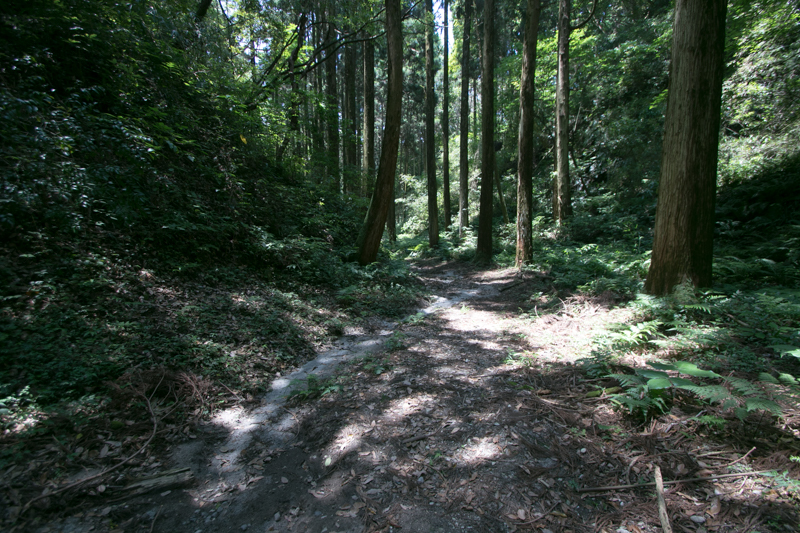 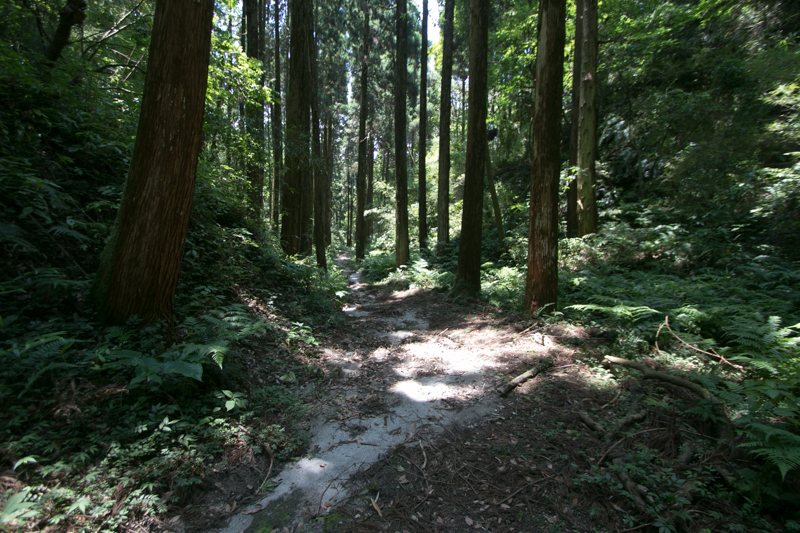 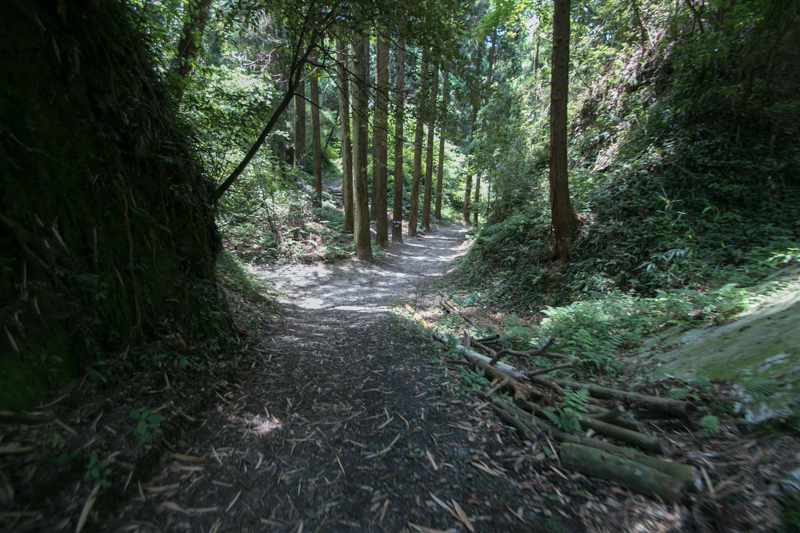 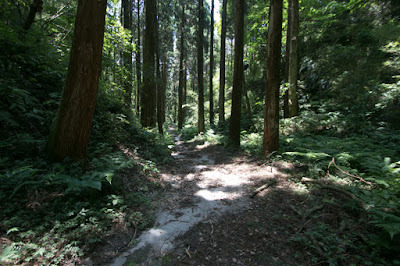 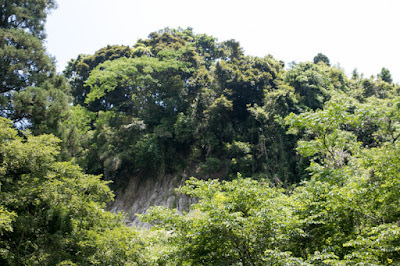 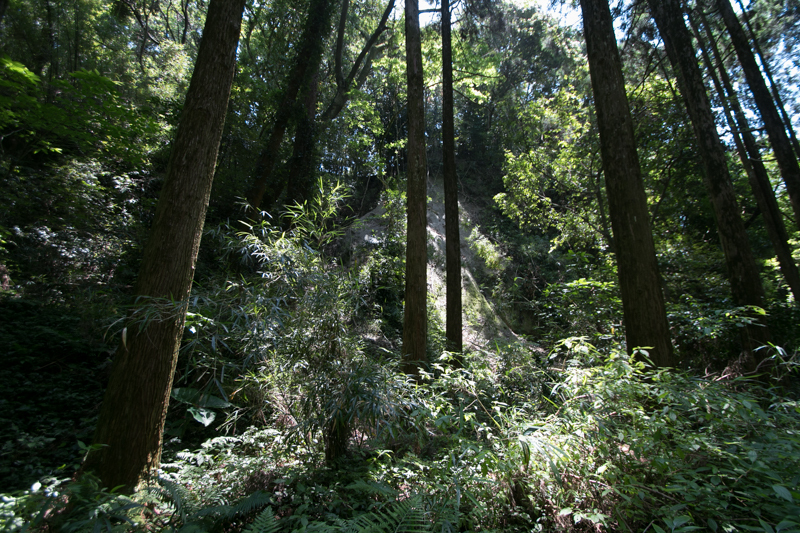 Ahead of center valley, there are two large areas named as Imajo and Yubajo. Imajo is a largest area of the castle which is over 150 meter long and 50 meter wide, and had a ruin of front gate decorated by stone walls. 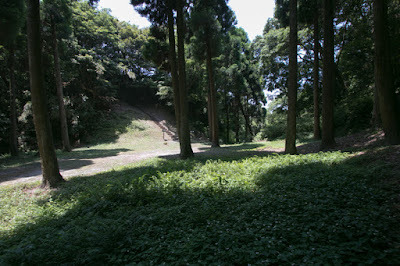 There might be a large residence of the leader, or close relative of the leader. 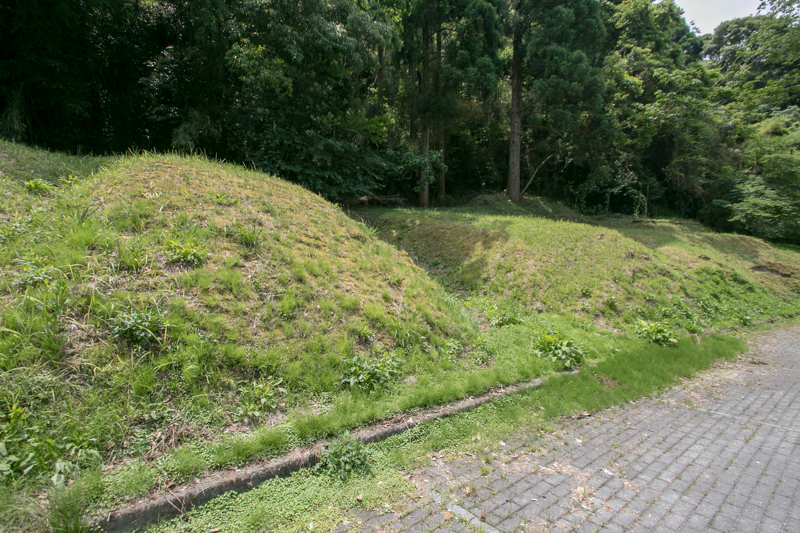 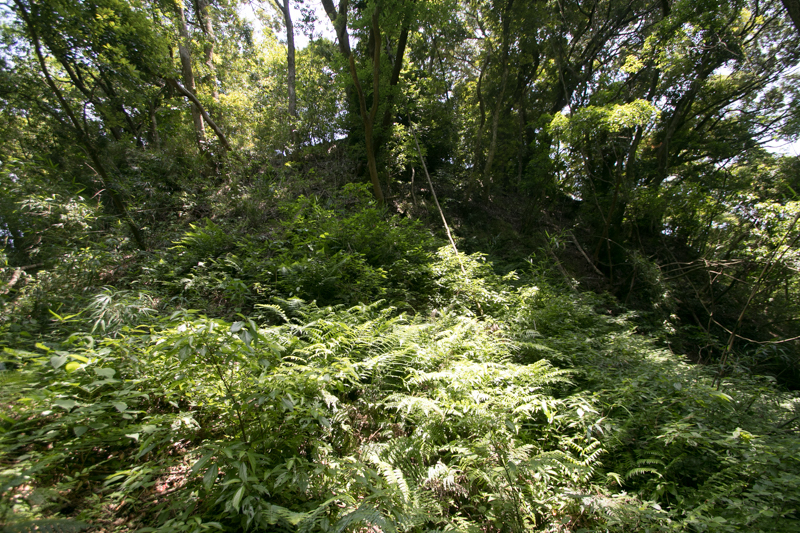 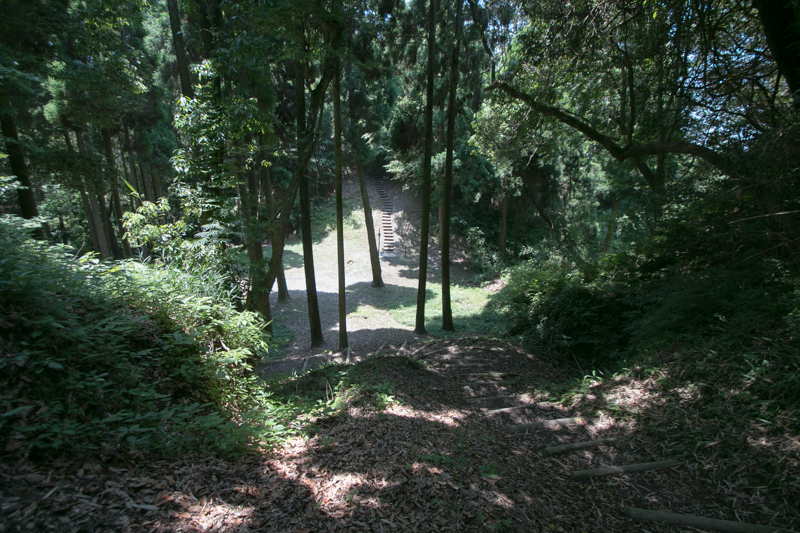 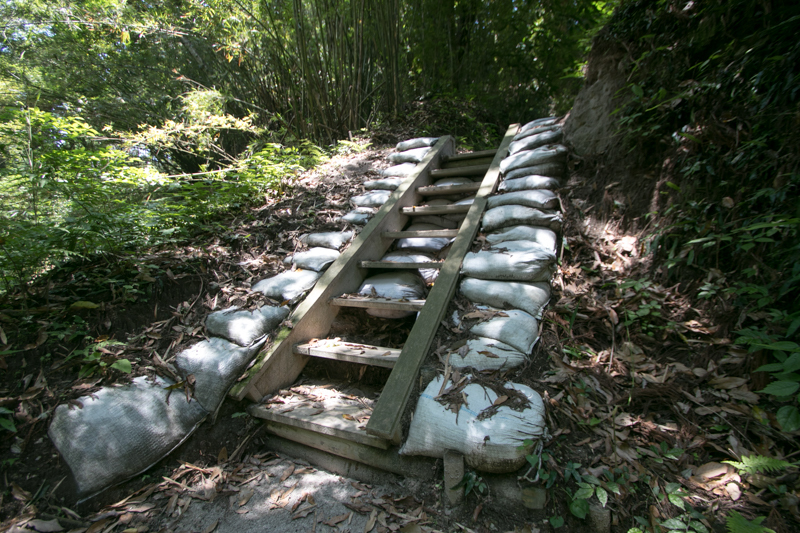 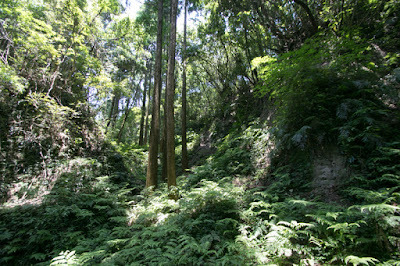 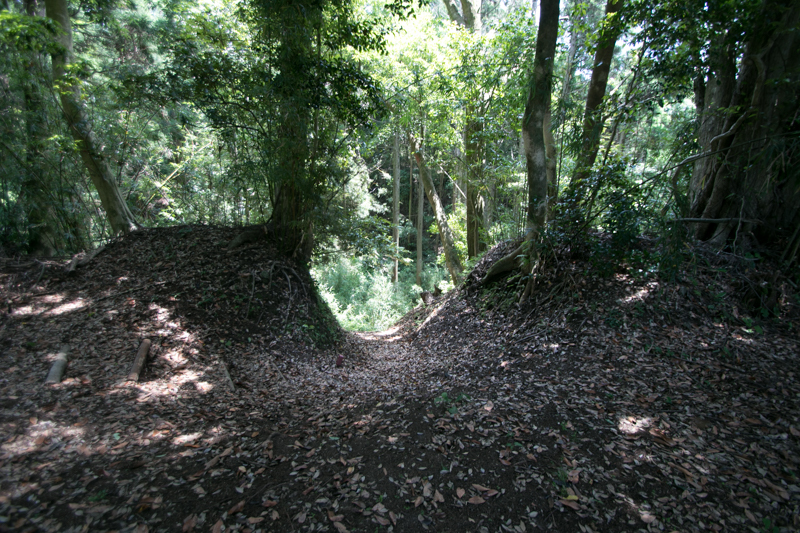 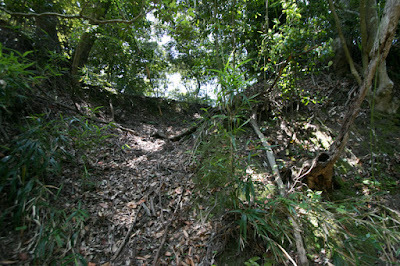 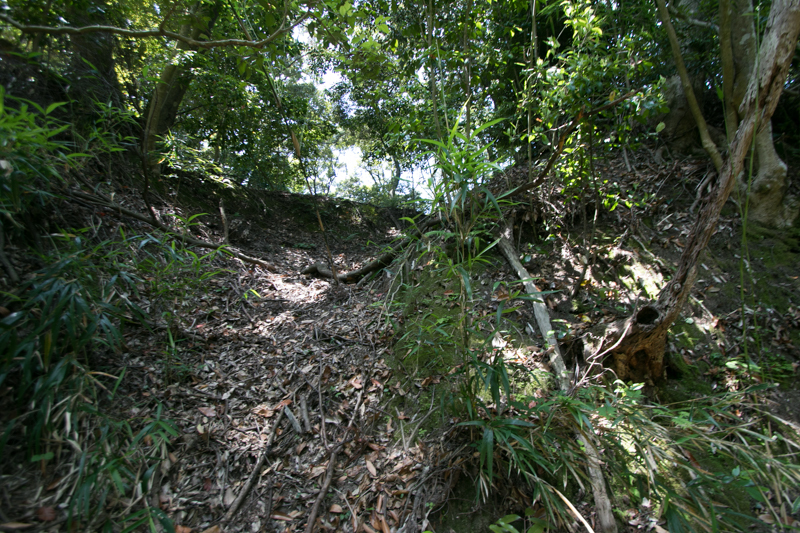 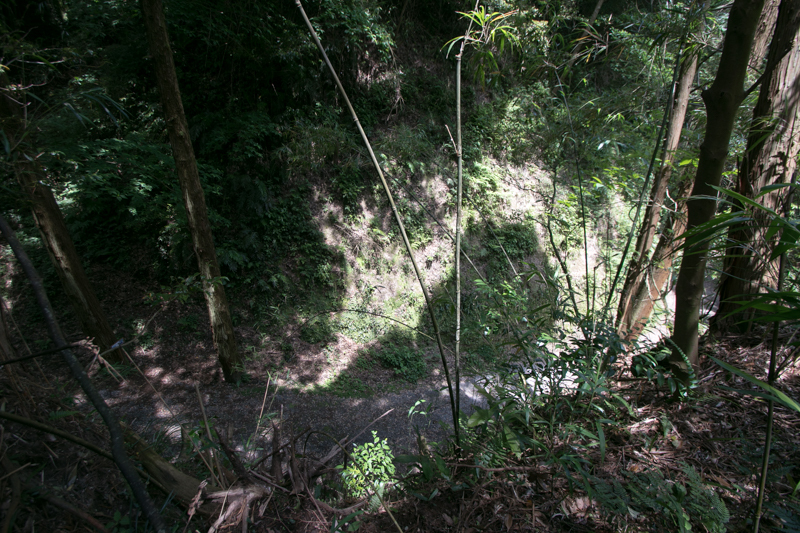 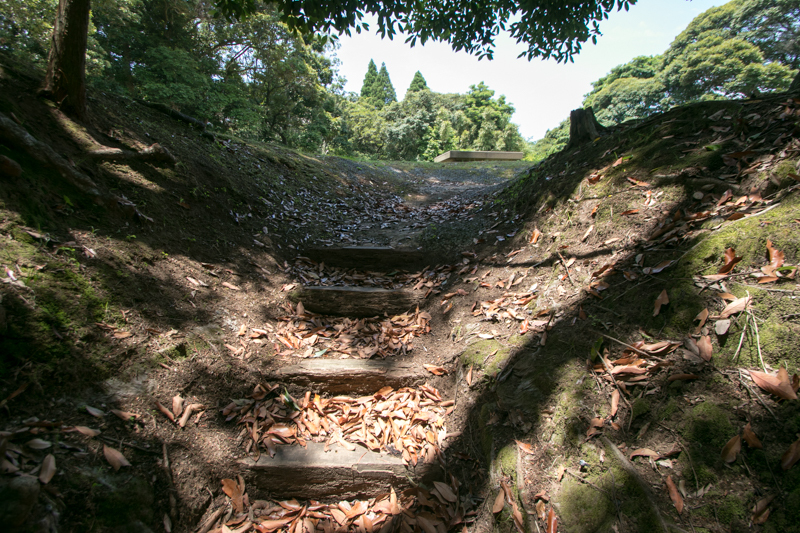 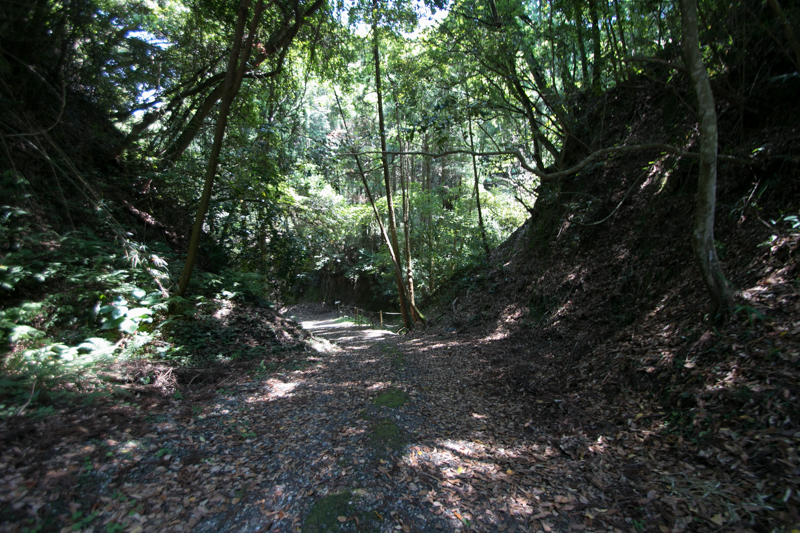 Yubajo is a front fort toward west and securely protected by vertical moat and corridors. 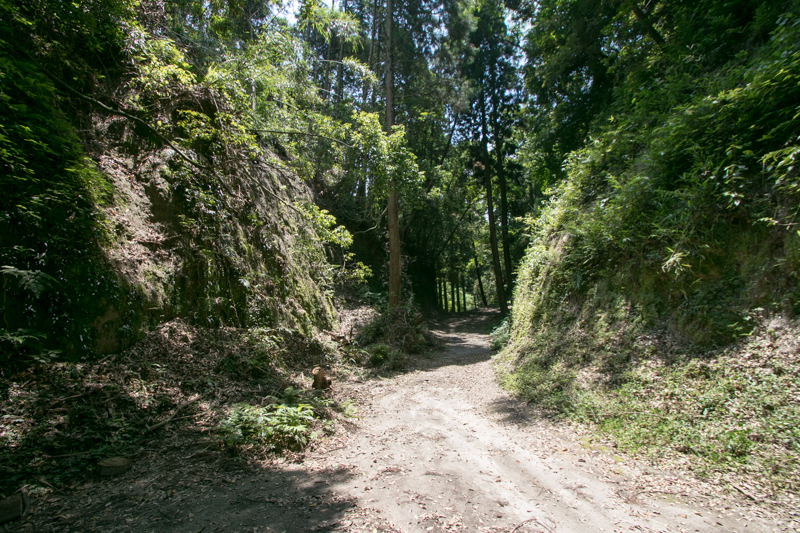 Surrounding these core areas, ahead of valley which separates core areas from the body of plateau, there are many flat spaces protected by sheer cliffs which worked as a residence of high class retainers and outer defense line of the castle. Total size of this double circled castle reaches to 600 meter square and one of the largest one at Satsuma province. 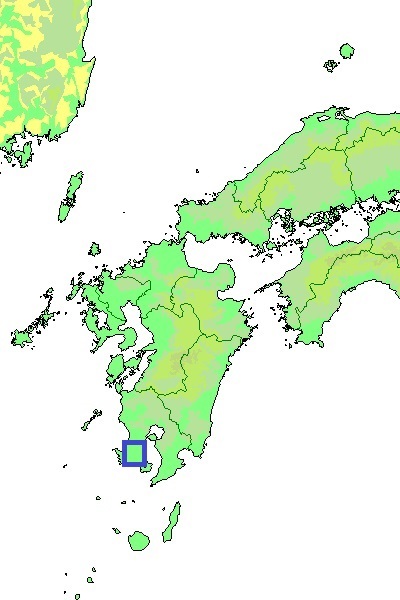 Main family of Sata clan once lost their leader at Kyushu campaign by Hideyoshi Toyotomi in 1587, and also lost their territory due to a suspect of piracy in 1591. 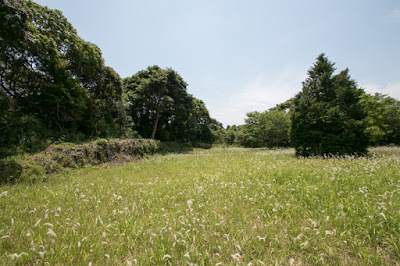 Chiran castle was once kept by Tanegashima clan, the lord of Tanegashima clan and famous for the arrival of masket gun to Japan, but in 1610 Sata clan returned to Chiran area. But by this time Chiran castle was lost by fire, and was formally abolished in 1615. In the middle of 18th century, the leader of Sata clan developed Chiran town and placed the residences of high class retainers along the main street folded at the center for defense. 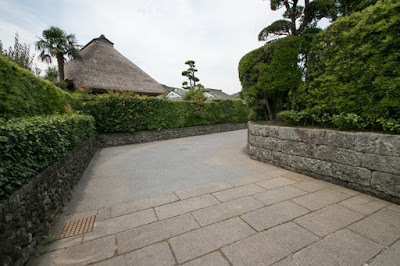 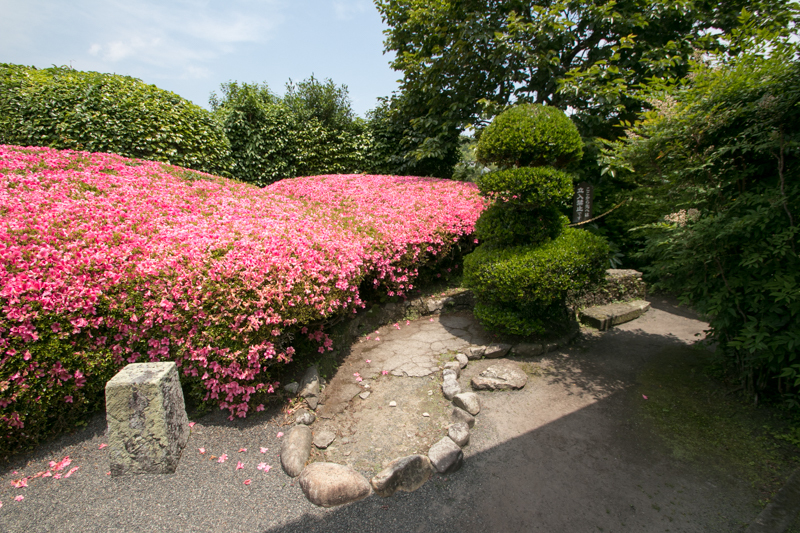 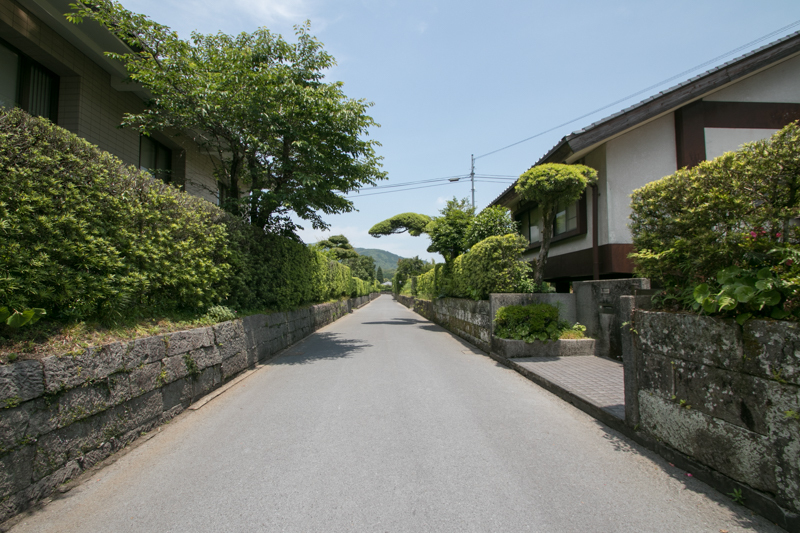 These residences is protected by stone walls and hedges, and some residences have beautiful Japanese gardens. 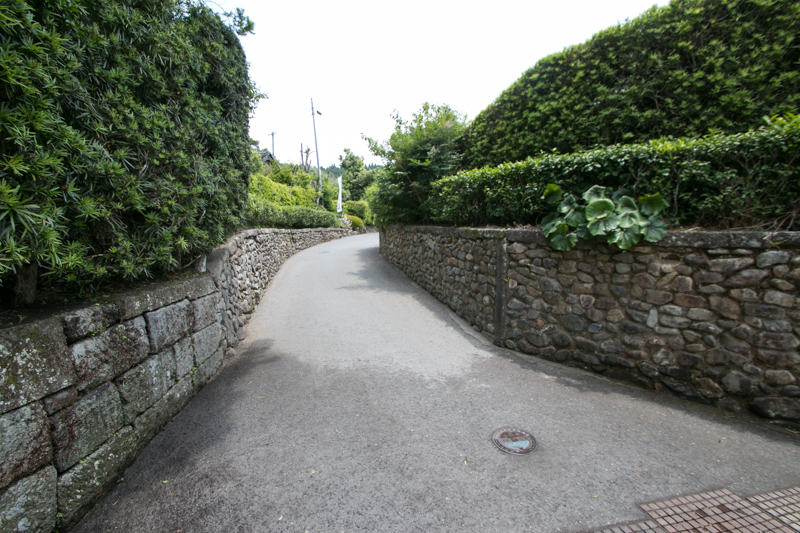 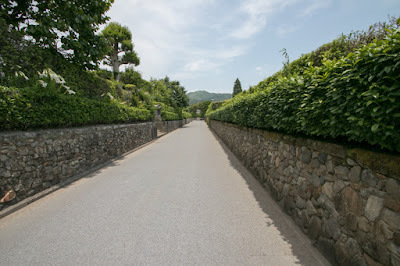 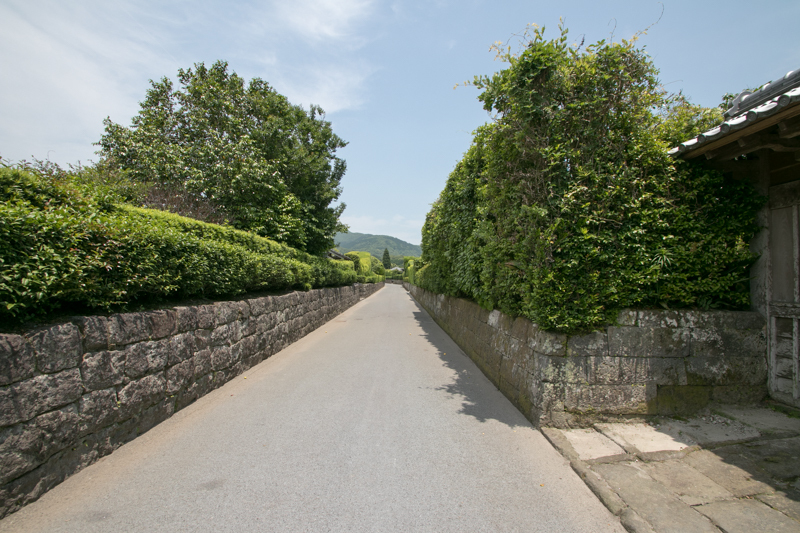 The scenery of main street with white color of stone wall and deep green of hedges still remains until now. 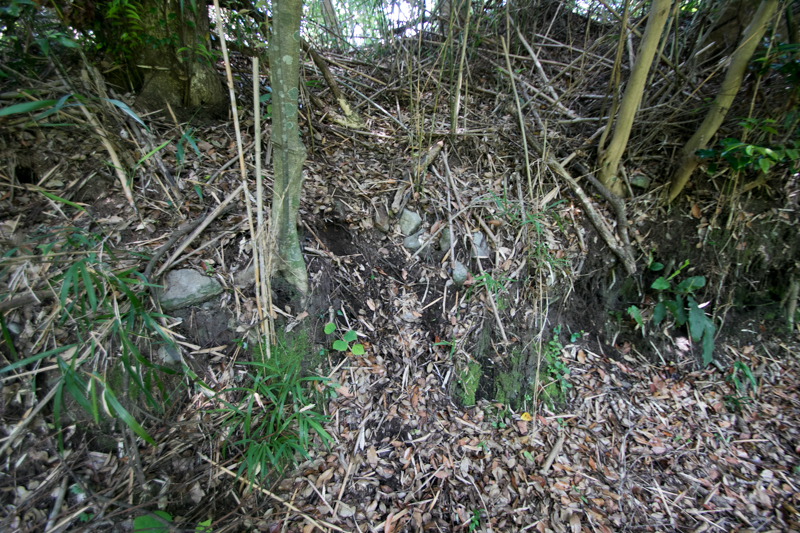 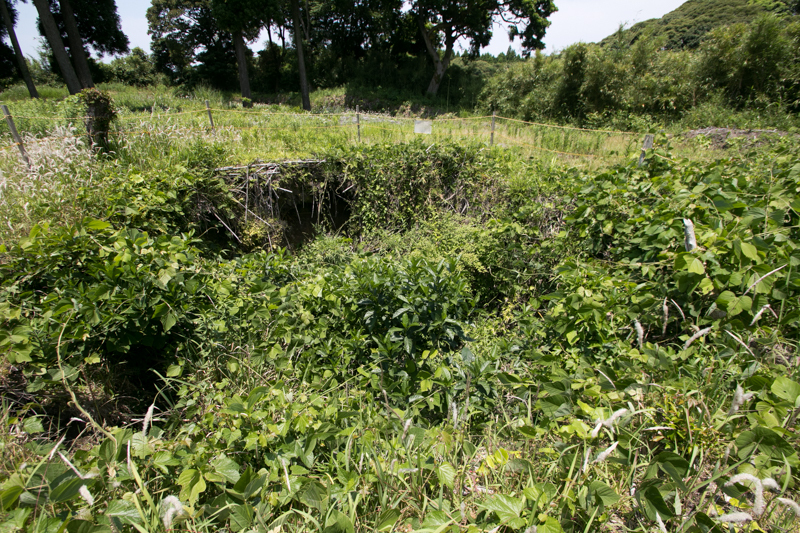 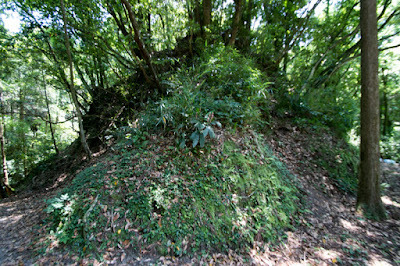 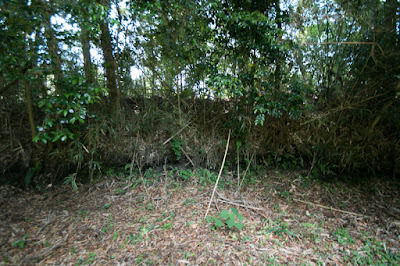 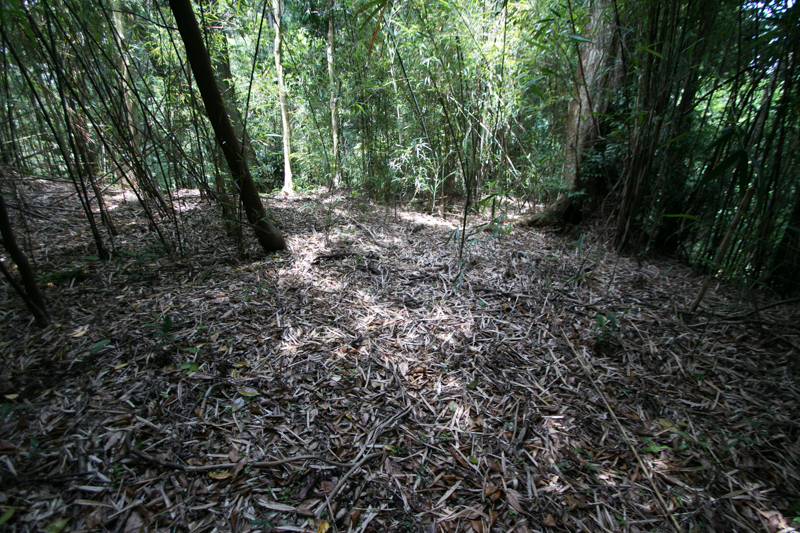 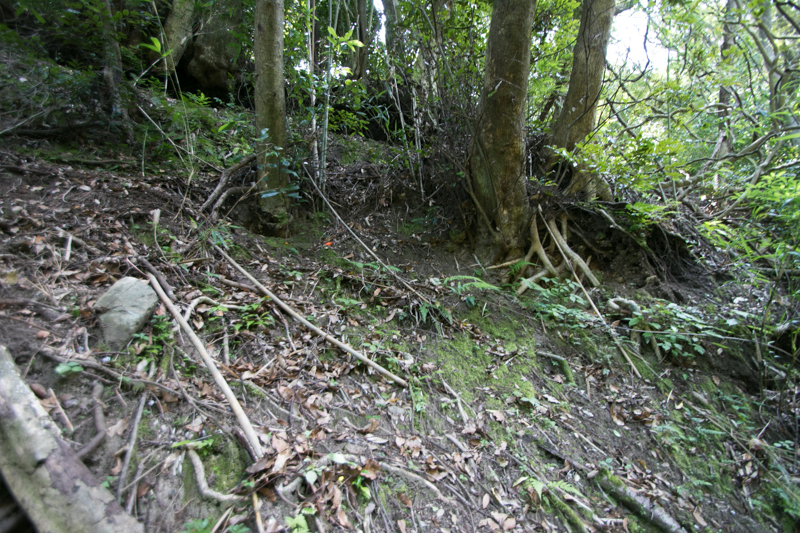 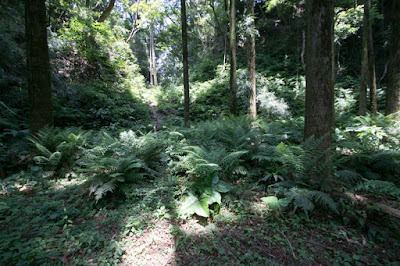 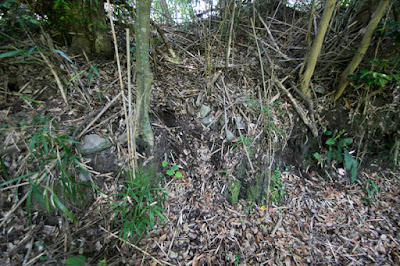 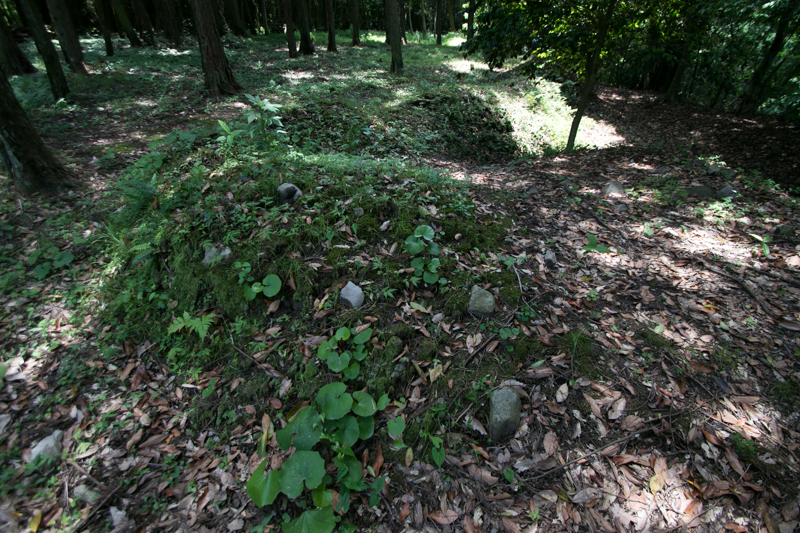 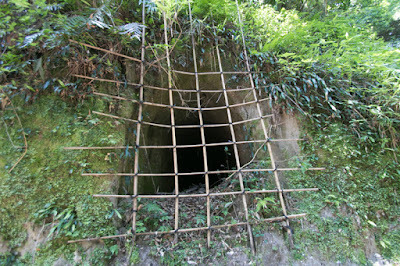 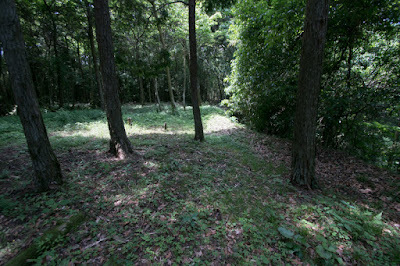 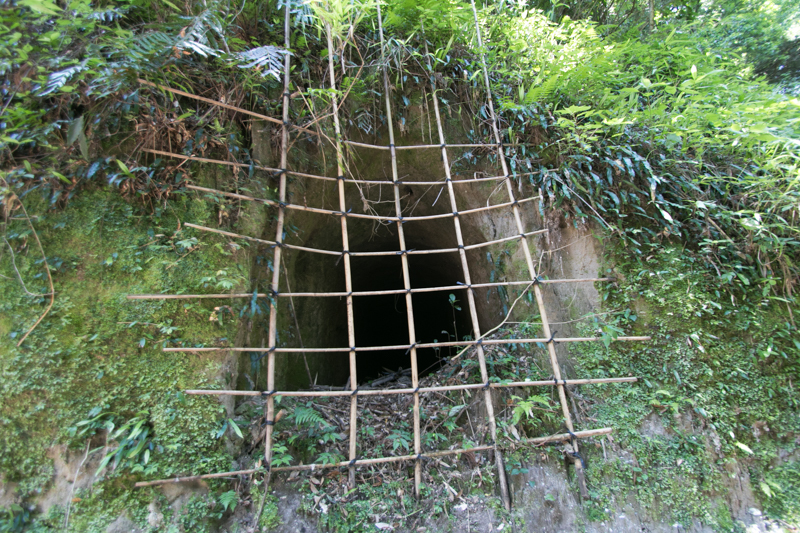 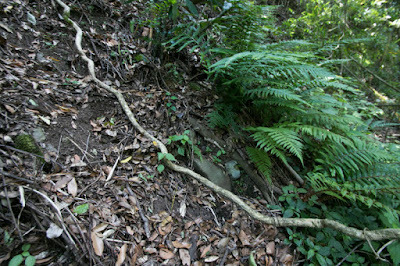 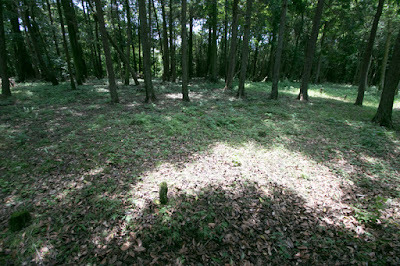 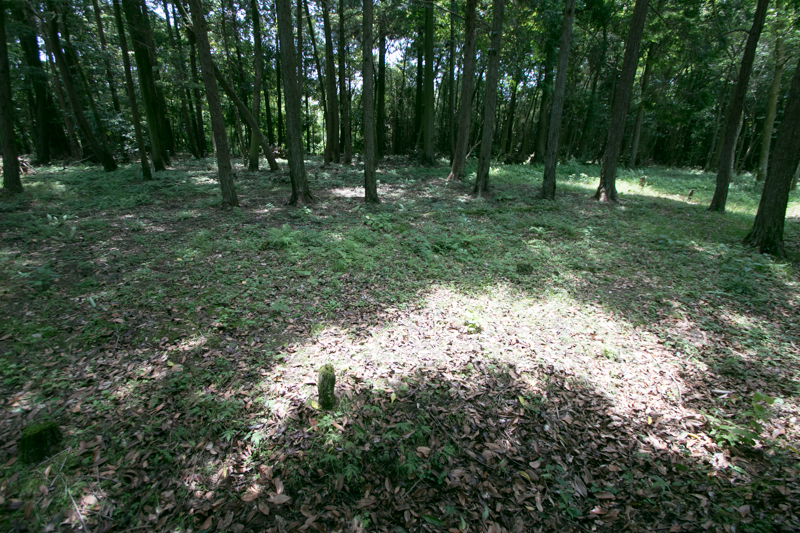 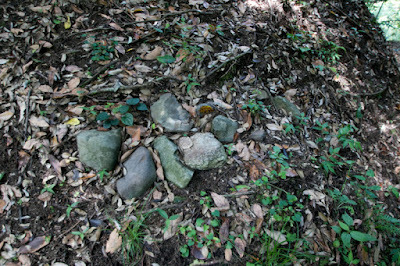 Today all building was lost but structures of the castle well remain in the forest. 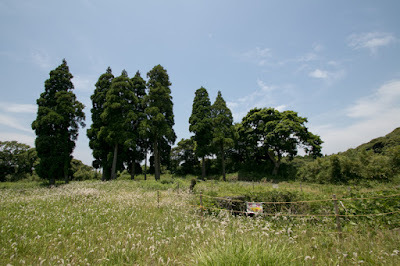 It is one of the large medieval castles at southernmost of Japan along with Koyama castle or Shibushi castle, and an combination of rough natural wall and artificial structures show the character of medieval castles in this area most clearly. 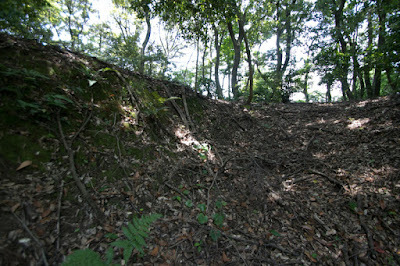 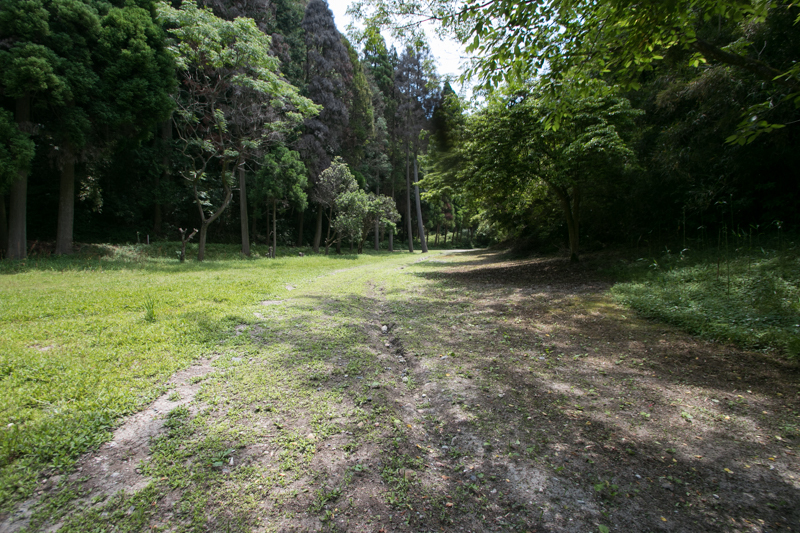 It is hoped this fragile ground of the castle is kept long time from natural disaster and human activity. 30 minutes bus ride from JR Kyushu Ibusuki-Makurazaki line Hirakawa station. 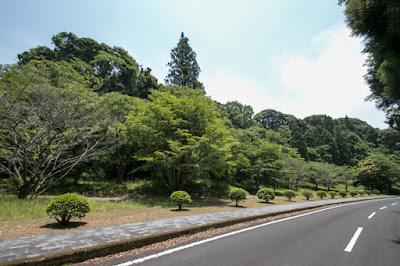 20 minutes drive from Ibusuki Skyline toll road Chiran interchange.